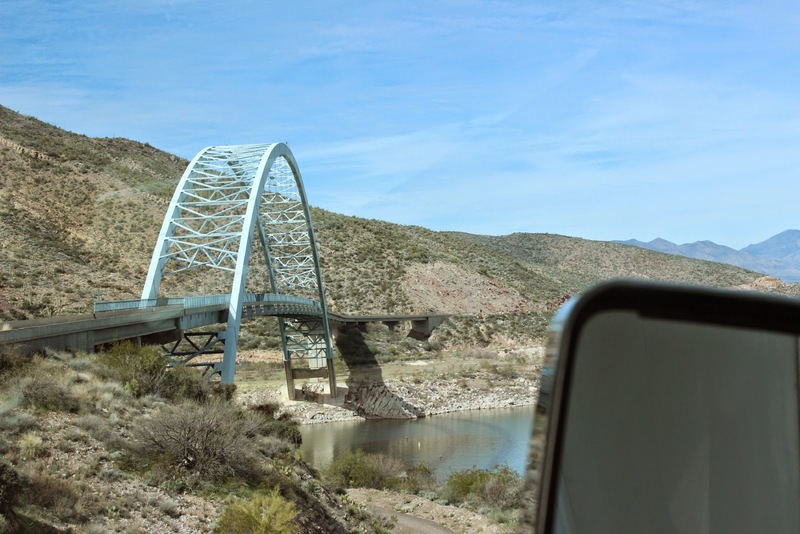 From Tucson, it was a nice ride up Route 77 towards Globe, Arizona. That was our mail pickup spot and, as it turned out, our pickup spot( at a Fry's grocery store )for the campground tickets.That is a Tonto Pass to the campgrounds in the Roosevelt Recreation Area among others in the Tonto National Forest. 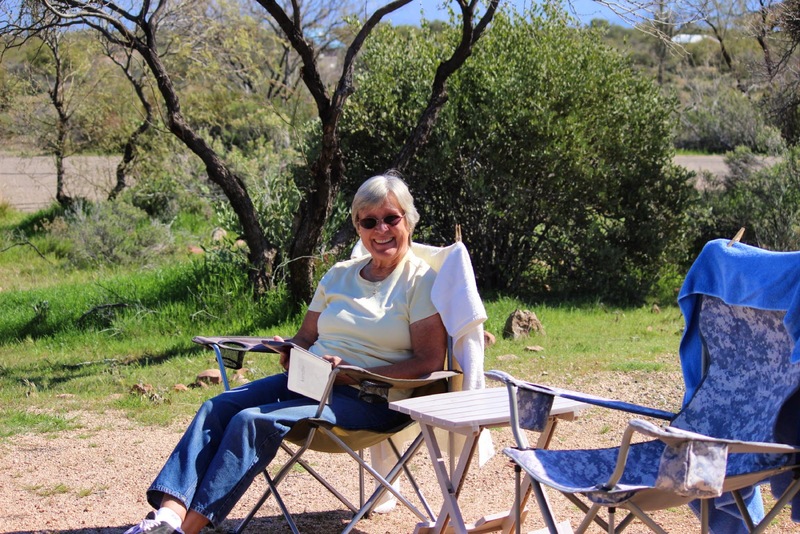 Our camping will be ------are you ready for it?------$3 per night with our senior pass. With our tickets, it's about 30 miles up Route 188 to the campground. Nice, large, level, widely spaced sites in the Jack Rabbit Loop of the Windy Hill Campground. The sunset above is from our site and Jan is enjoying the view down to the lake. 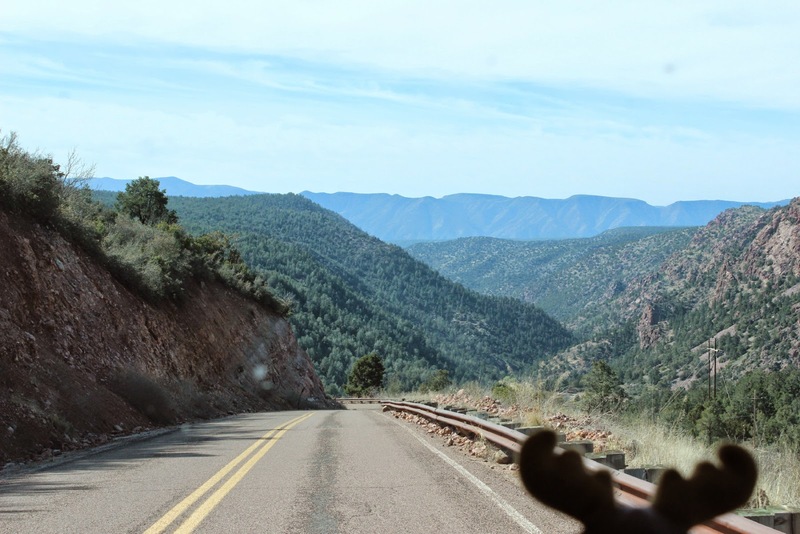 Eustis is enjoying the view as we travel on Route 188 to the visitor's center. 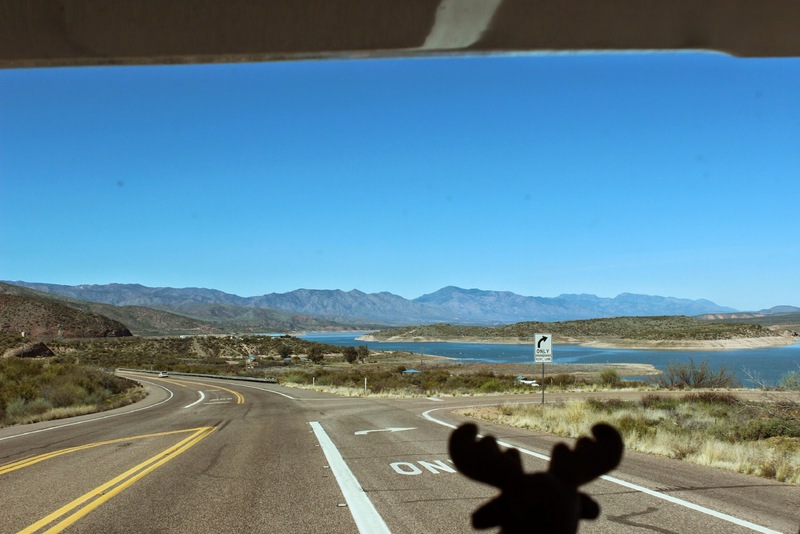 The road follows the man made Roosevelt Lake north to the junction of Route 87. 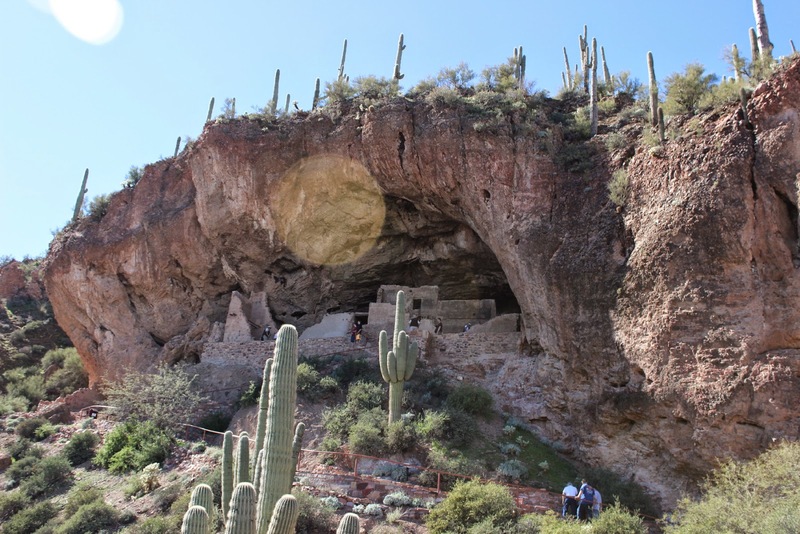 Across the street from our campground is the Tonto National Monument(Cliff Dwellings). 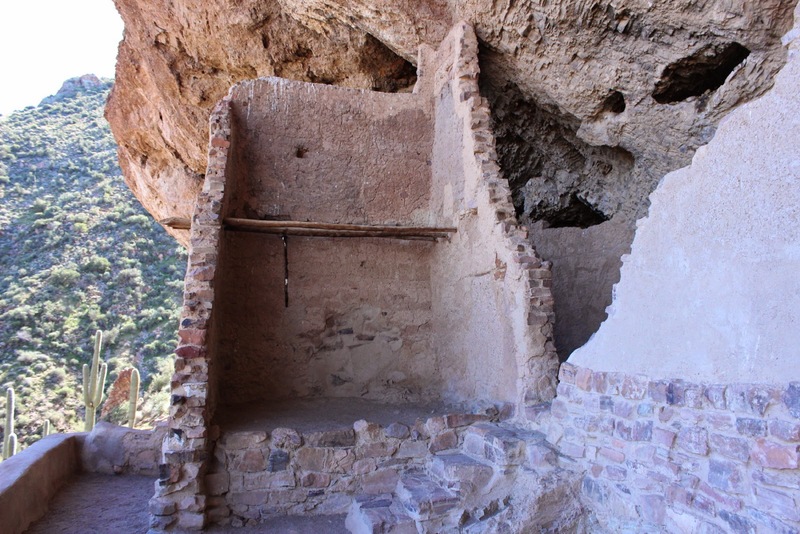 The cliff dwellings are at least 1,000 feet above our campsite. Lady Blue takes us part of the way and the rest is a good climb. Nice view though. Our campsite is straight ahead, not too far from the water. See it???? Neither can we. Remember, you can click on pictures to enlarge them. 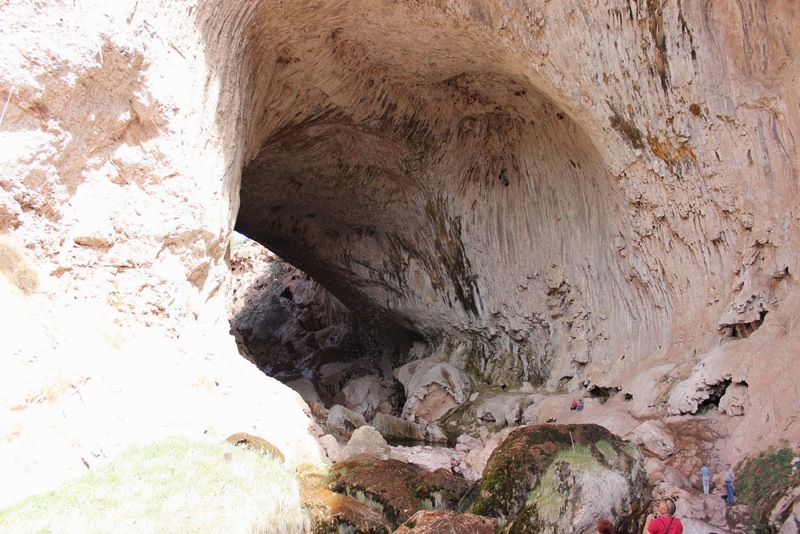 You can see dwellings in the cave as we hike up. There are people on the trail in front of us. The sunspot is due to the angle of the camera, not your computer. 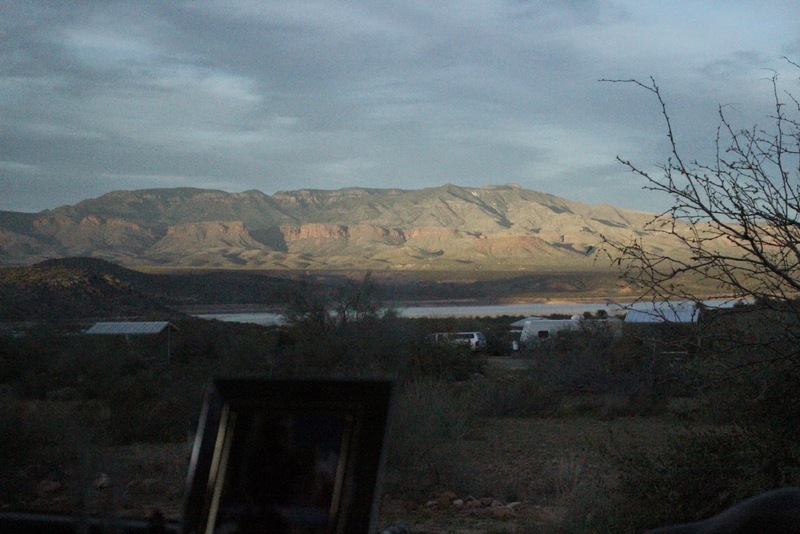 This tribe settled along the Salt River before Roosevelt Lake(named for Teddy) was made. It was about 1,000A.D. Why way up in the caves? Cooler in the hot summer, protection from severe summer storms, and also natural protection from raiding Indian tribes. 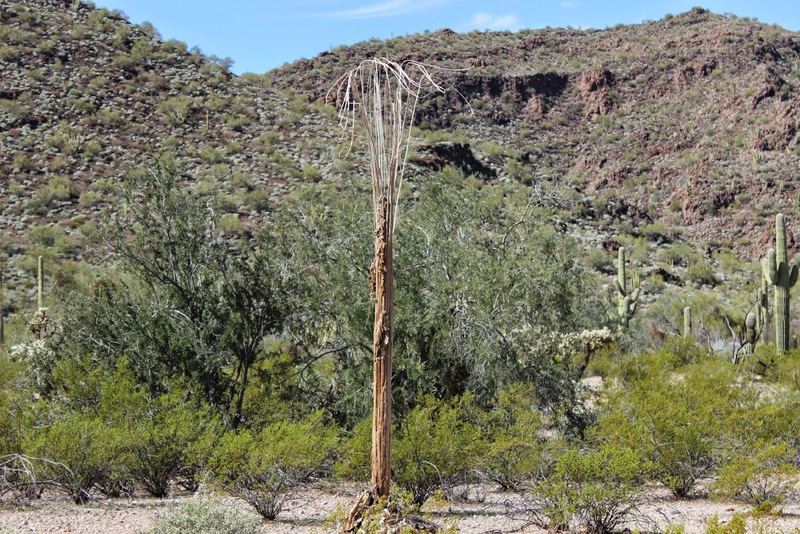 Some of the structures have been lost, but you can see how they used Mesquite sticks and also Saguaro sticks to form an upper level for sleeping. This cave may have housed up to 60 members. The tribe farmed the lower levels with cattle and vegetables such as corn. As you can see, they had a commanding view of the valley. This was also a way for them to communicate with other villages in the line of sight. Okay-------now, can you see Lady Blue in the parking lot? And yes, our campsite is still straight ahead. Another way of looking at it. This is a telephoto shot from our campsite up to the dwellings(towards the left). After a few wonderful days, we decide to head a little north. Following Route 188, we pass by the Roosevelt Dam and the new bridge( circa about 1990's). The old road went right across the dam. Jan is enjoying using the new camera!! 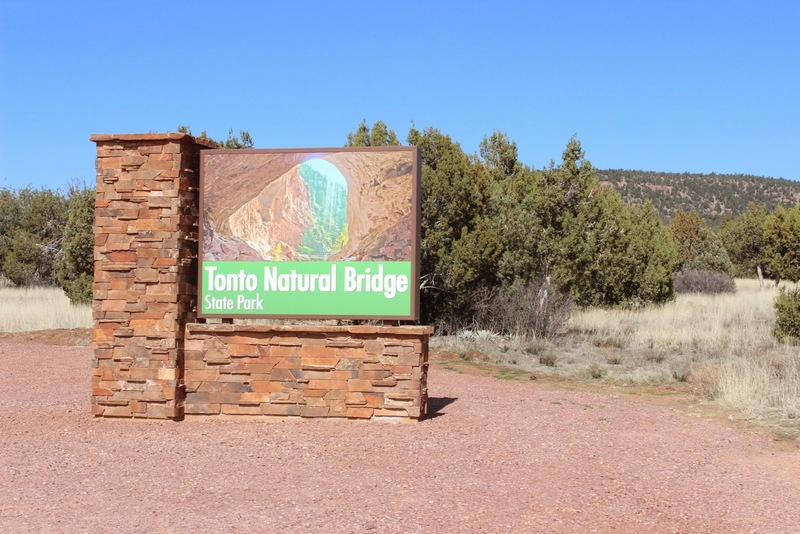 Along the way are a number of Tonto exits for picnic areas and camping. 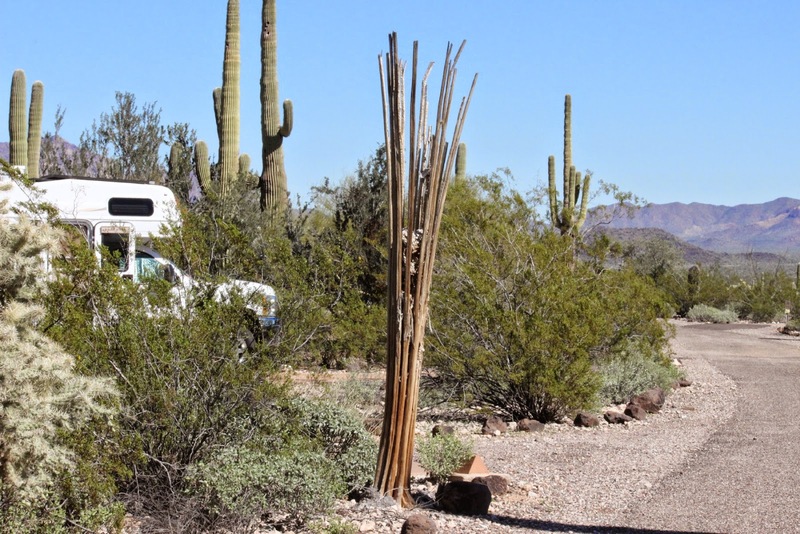 This area is quite popular for campers--using the Tonto Pass. Note that there are some big rigs here with trucks and boats. The easy access to the lake makes it a drawing card. 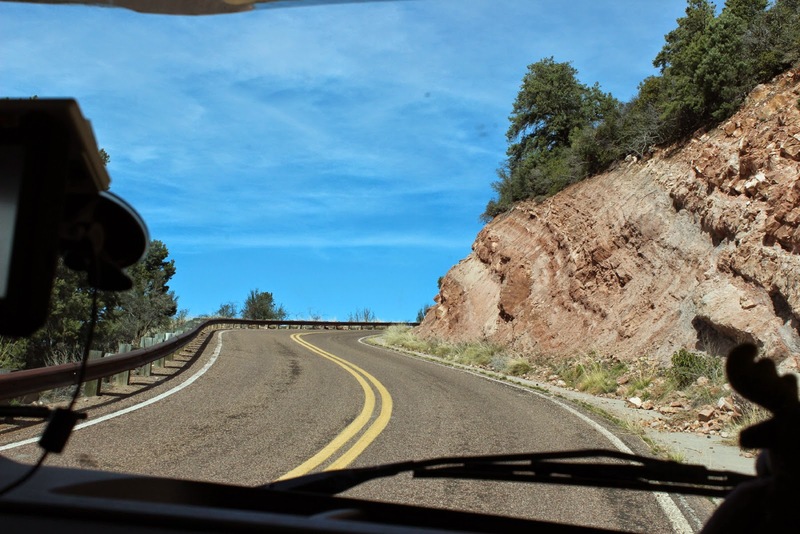 Route 87 takes us into Payson, Az. We have climbed from about 2,000 foot elevation to over 5,000 foot elevation. At the top of this plateau , the town of Payson is a center for all that happens within a hundred miles or more. A pleasant town that has just about everything you could need. We found a Notary Public, a dump station, good gas price, and more. During the summer they have rodeos. There is also a rebuilt version of the Zane Grey cabin. For those who are too young, Zane Grey wrote novels in the early 1900's , based in Arizona ,that were beloved by readers all over the world. His stories contributed to movie success of names like Shirley Temple, John Wayne, and Tom Mix. 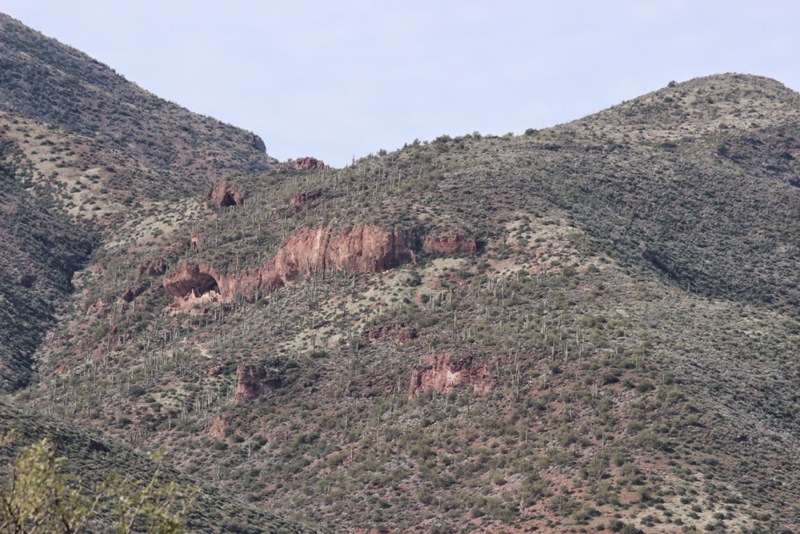 This link gives a lot more information Zane Grey info . 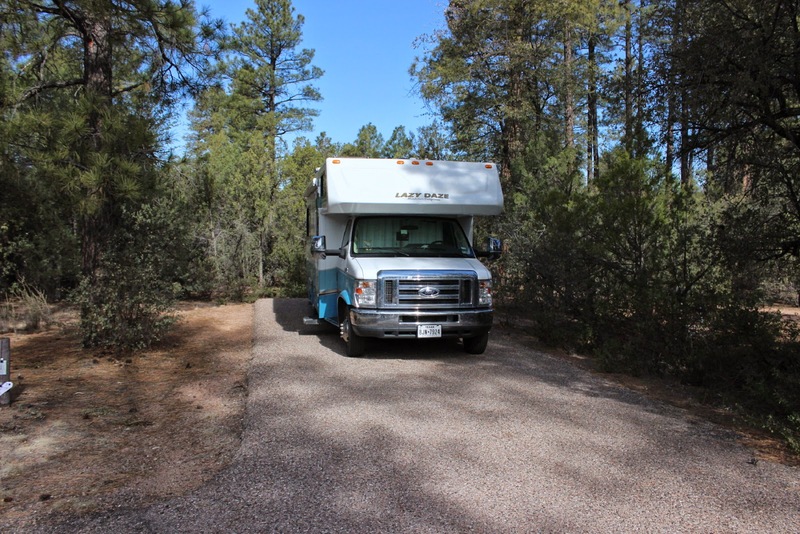 The picture above is our site at Houston Mesa campground in the Tonto National forest. Note that we are way above the high desert vegetation. There are tall pine trees, cedar, juniper ,and some hardwood. The elevation also made for a cold night--in the 20's. We know----no sympathy from the minus zero degree temps in New England. 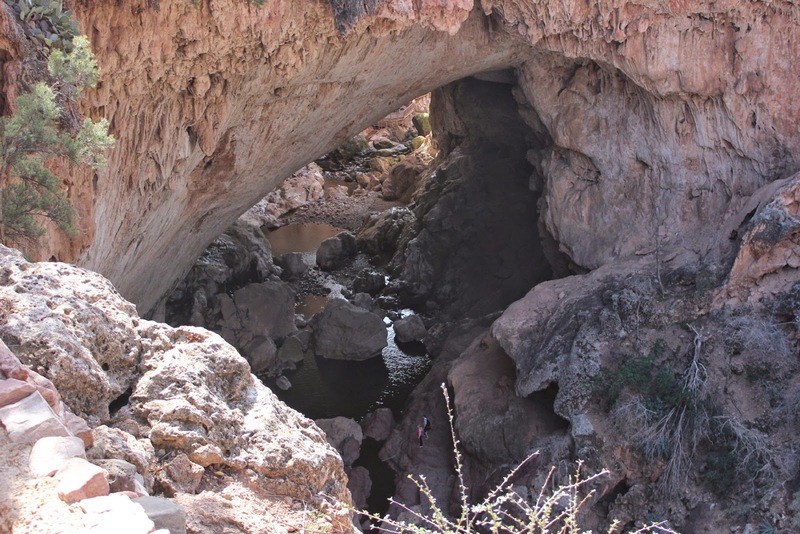 Just north of Payson, the road narrows and one of the attractions is the Tonto Natural Bridge. Lady Blue willingly climbs even higher and then we enter the road to the Natural Bridge. The sign says 14 per cent Grade!! No problem !!!????? Eustis looks worried. In case the family was wondering what might be here. Click and enlarge. 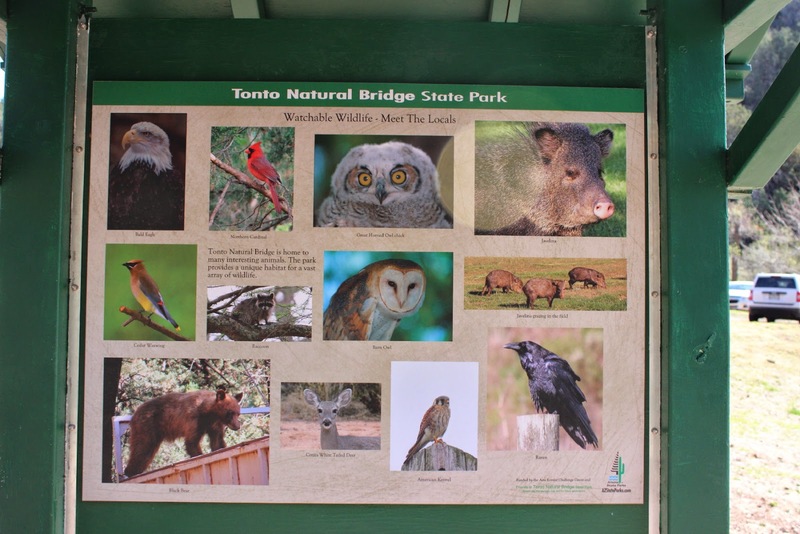 This section of the Tonto along Route 87 and the Route 260 made note of bear sightings and bear attacks. Quite active in this area. This picture above shows the view into the natural bridge from above. Note the couple at the bottom of the picture to give you an idea of the size of this arch. This was formed over thousands of years by water dissolving the minerals and washing them away. This is a view from below. The story indicates that a prospector discovered this arch while trying to hide from chasing Apache. He liked it so much he filed a squatters rights claim and then invited his nephew and family in 1898 from Scotland. 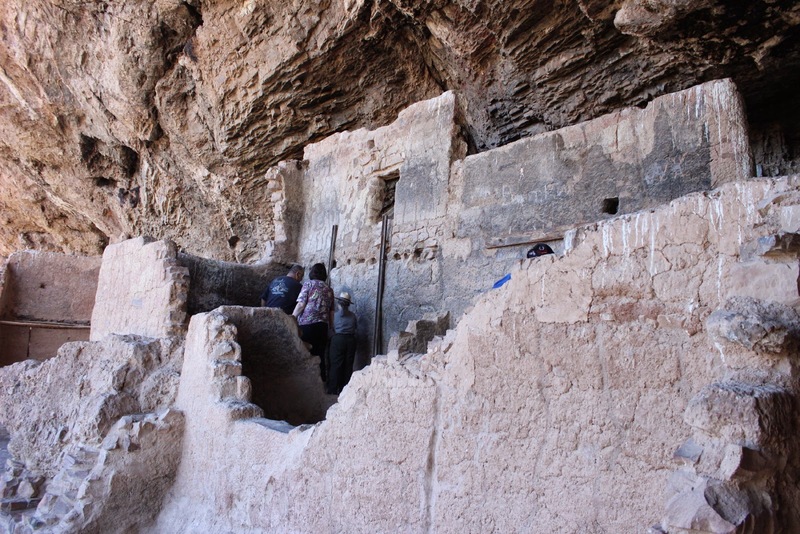 They had to lower their possessions by rope and burros from the mountains down to the valley. 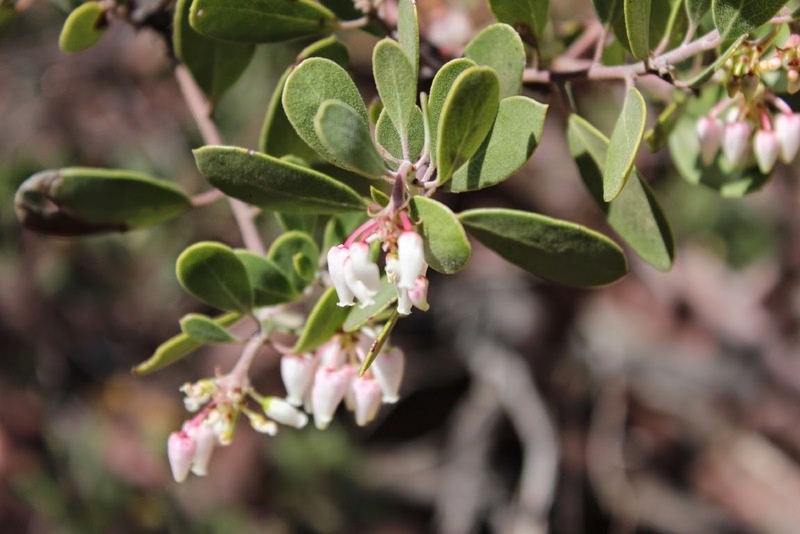 It's February, and even at 5,000 plus feet the Manzanita bushes are blossoming. 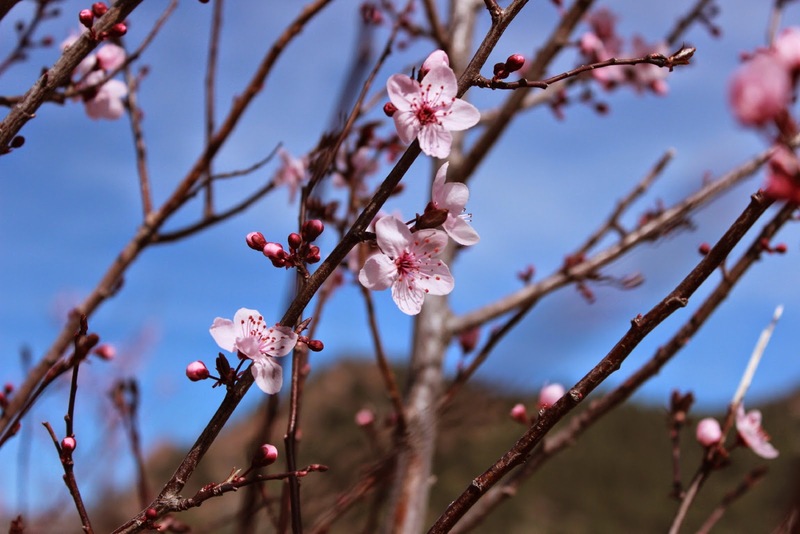 Not only Manzanita, but some familiar Cherry blossoms are to be seen. Hey, Spring is officially here in less than one month. WE will not need the burros to climb out. Lady Blue is able to climb the 14 per cent grade back up out of the valley. We will have to treat her very nicely for the next few days. Good job Lady Blue. 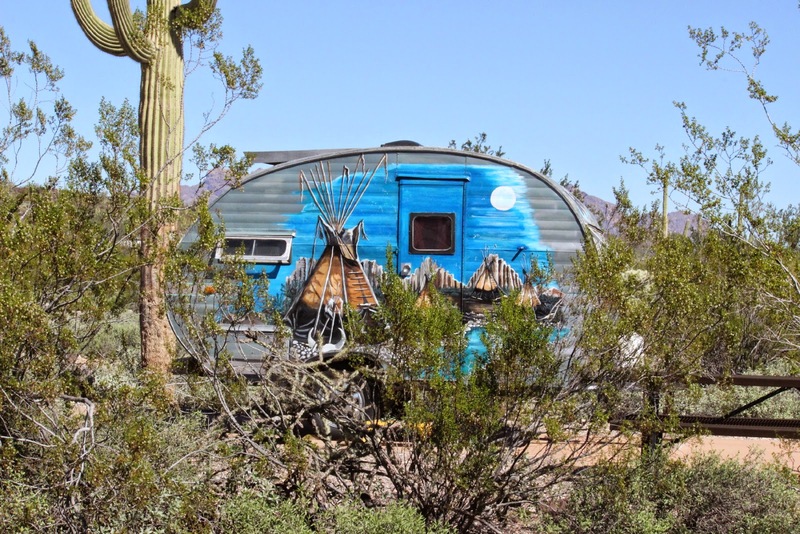 And yes, there were no other RVs down in the valley. 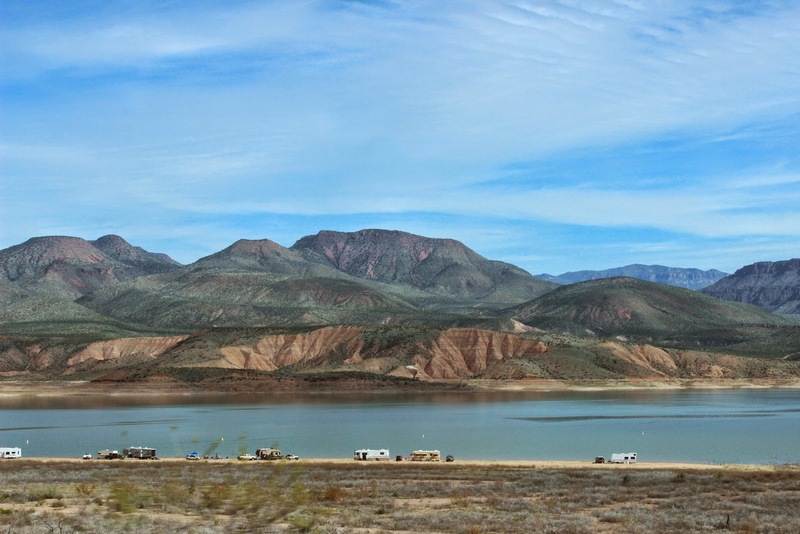 After the Natural Bridge, we came back for a few days to Windy Hill at Roosevelt Lake. Hard to leave views like this from our new site. It required a firm decision to leave Organ Pipe. Such a beautiful spot! 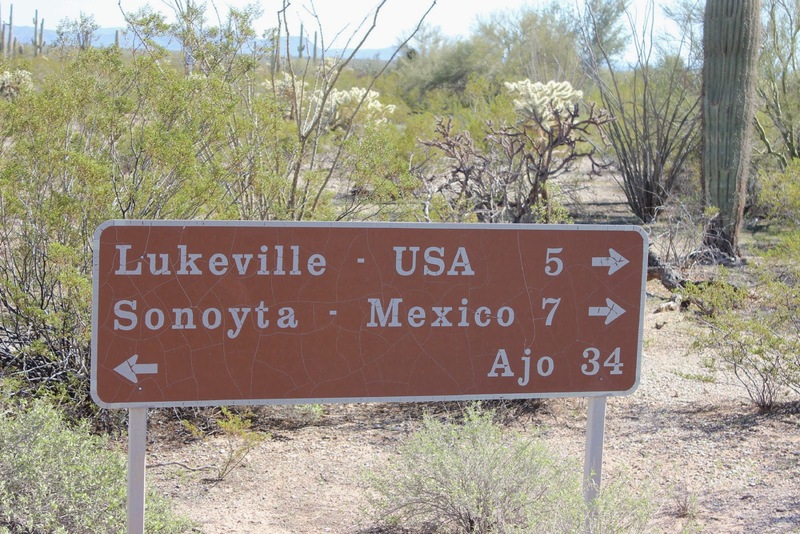 We follow Route 85 north to Why and then Route 86 east to southwest Tucson. One of the quietest roads in Arizona. 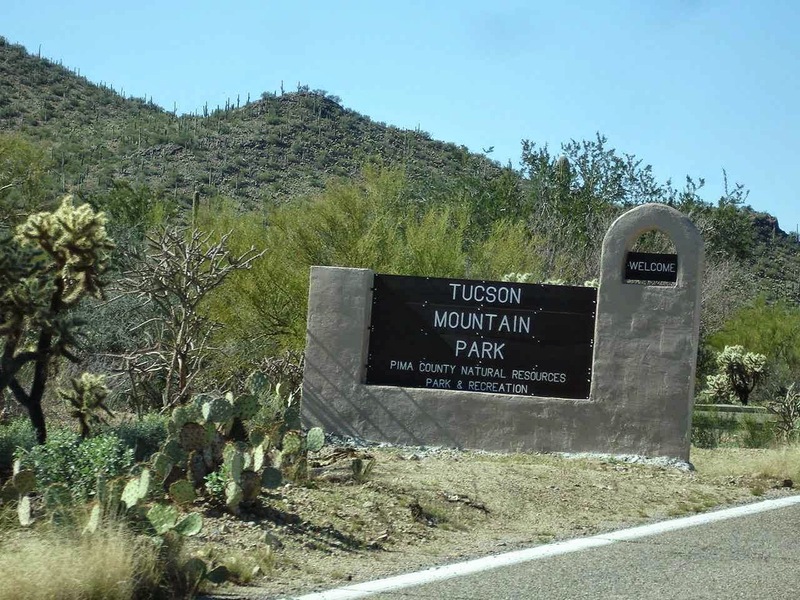 Not too far south of Route 10, it is a left into Tucson Mountain Park. Also, a number of hikes, short and long. Most of them require some climbing. 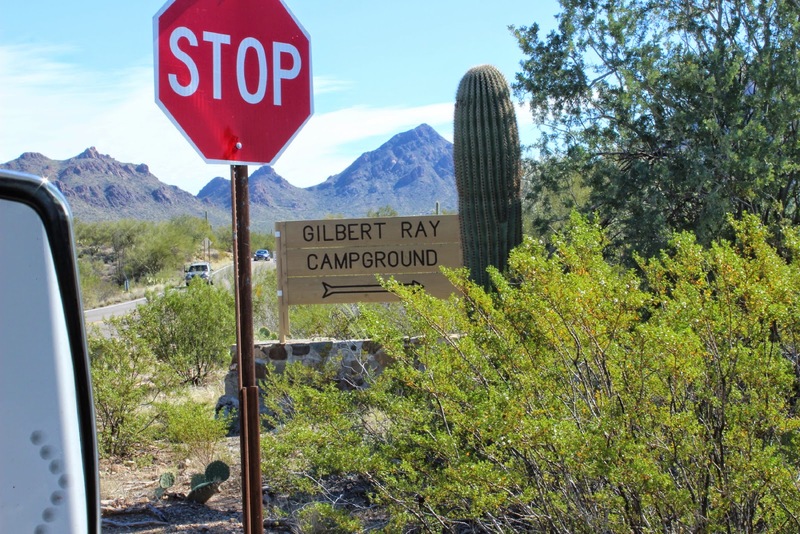 Our stop is at Gilbert Ray Campground. Nice, open sites with good spacing. We had our own little cactus garden. Electric hookup only for $20 per night. 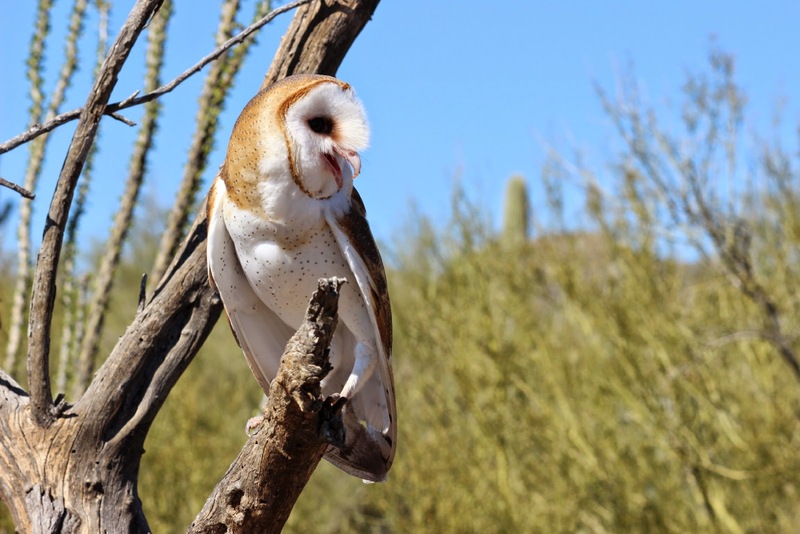 Within a few miles of the campground is the Arizona Sonora Desert Museum. According to TripAdvisor.com, it is ranked as one of the top ten museums in the country. With 98 acres, they describe themselves as a fusion experience. That is, zoo, botanical garden, art gallery, natural history museum, and aquarium. This being Arizona, 85% of the museum is outdoors. Did you guess the car? 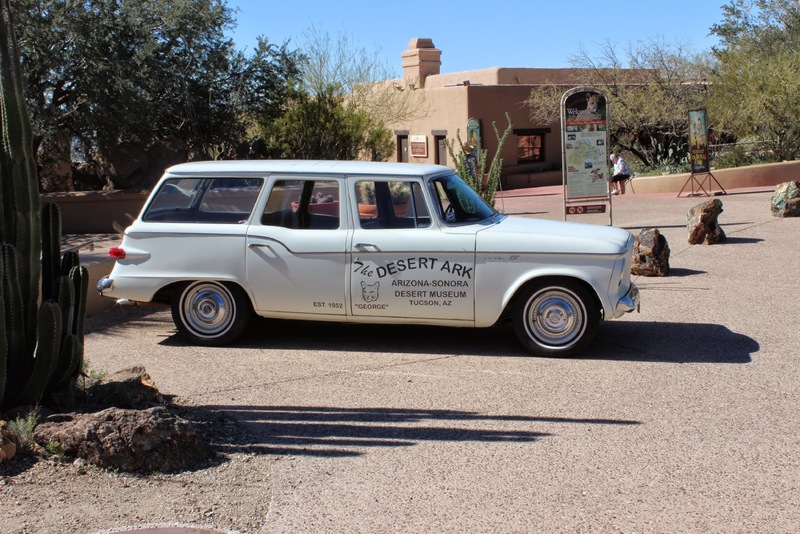 A 1960 Studebaker Lark. 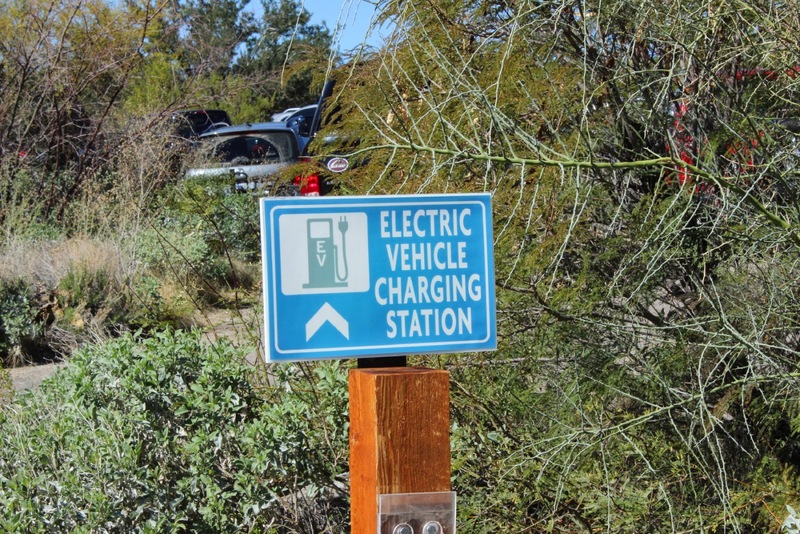 This is the second place in Arizona that we unexpectedly found charging stations for electric vehicles. The other was in Gila Bend. All along the walkways are plants from the smallest cactus to the largest Saguaro and Palm trees. 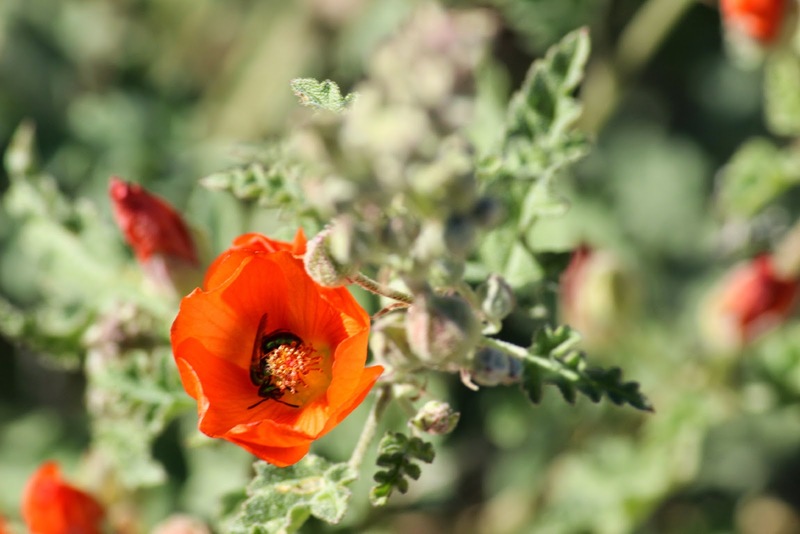 Many bushes and cactus are in bloom even though the ordinary plants around Tucson are just beginning to show buds. Even the bees are quite happy on a warm February day. 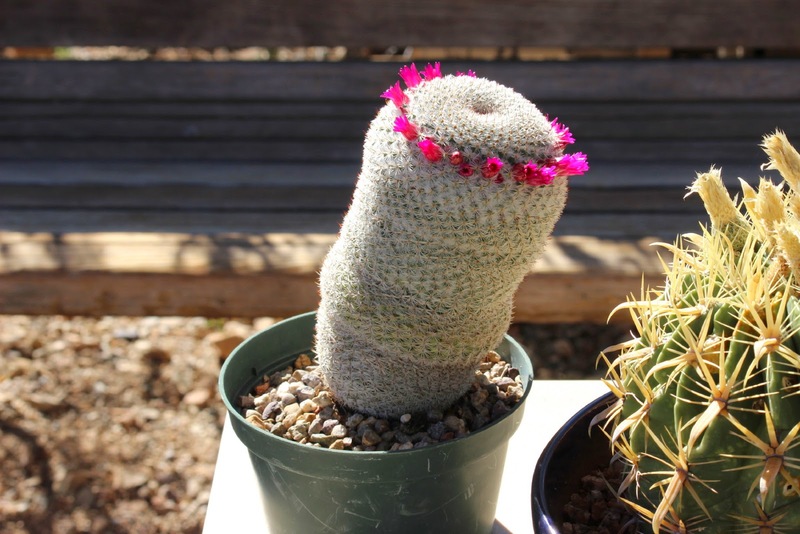 This picture show a Pincushion Cactus. 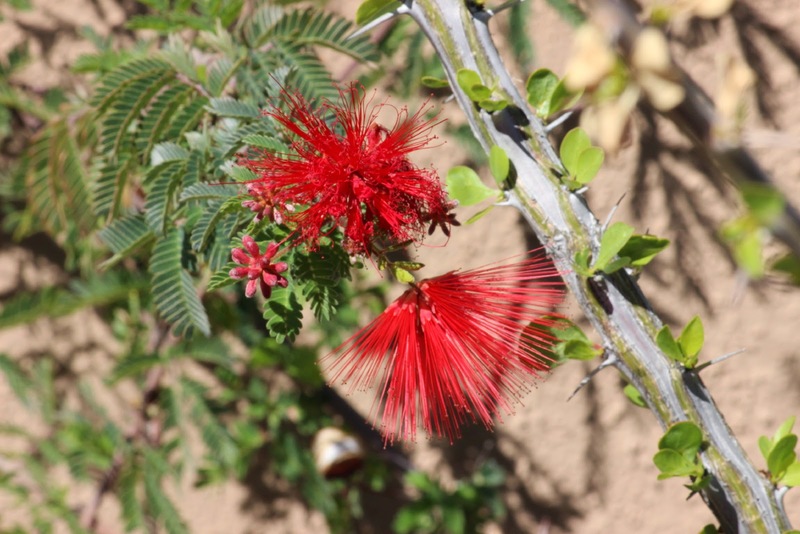 So many varieties , not all of them native to Arizona. Jan and I stopped here two years ago and loved the museum. We stopped here again this year and found more things to appreciate. And not enough time to enjoy in one day. Besides the plants and gardens are live animal shows. 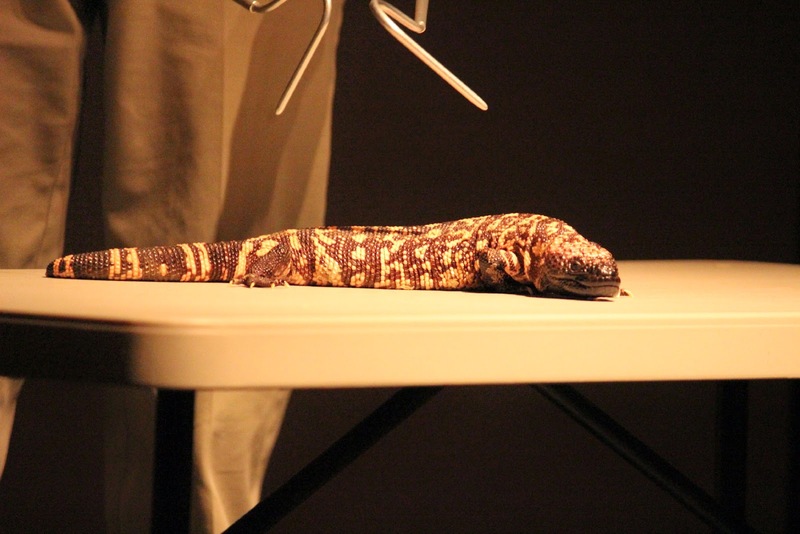 This fellow is a Gila Monster. Lots of information in the Live and (sort of) on the Loose show. 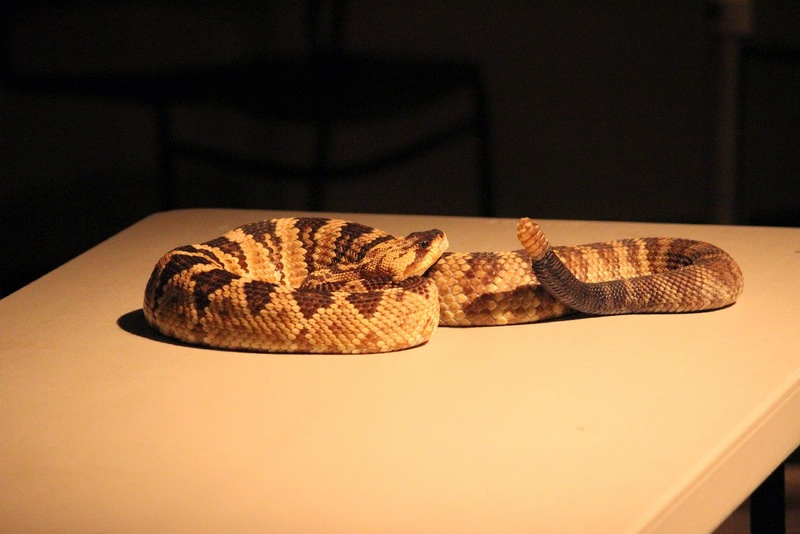 As expected, the star of the show is a Black Tail Rattle Snake. 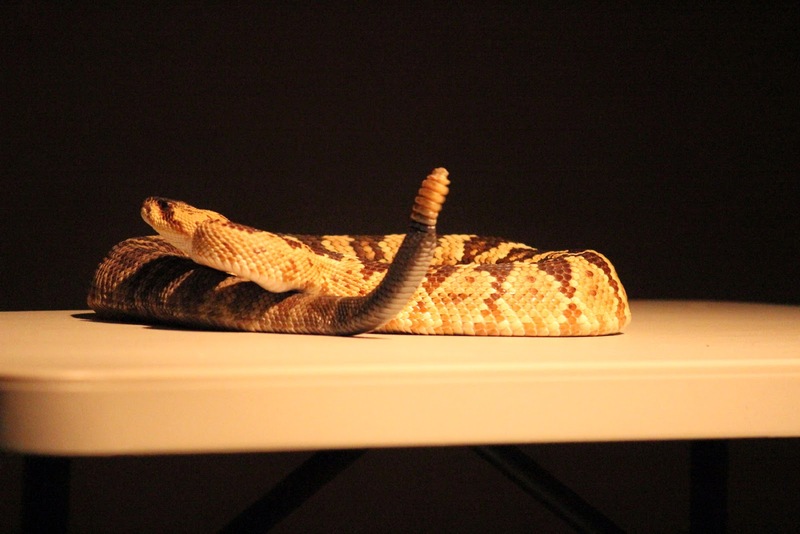 About three and a half feet long, this was an older snake that rattled on during most of the talk by the handler. This picture shows the snake rattling and about to try a strike at the handler (who stayed a safe distance away using two metal sticks). Can you see the split tongue? 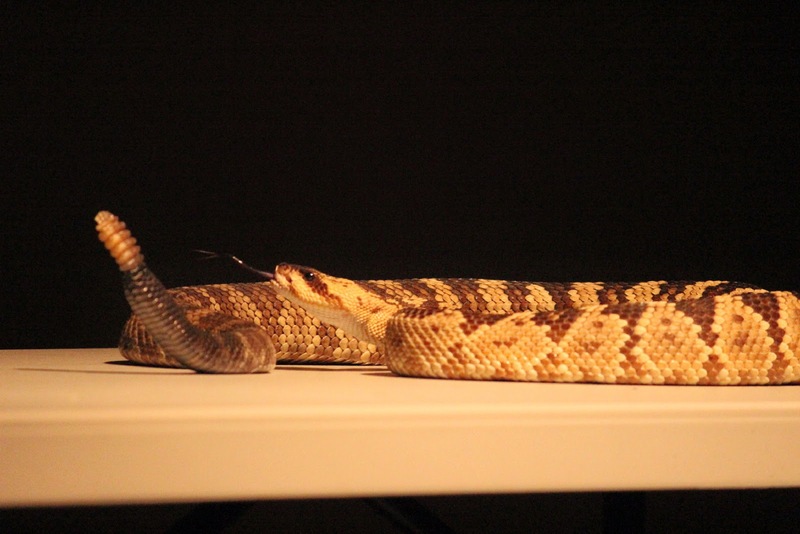 Arizona saw about 270 snakebites last year. About 1% of bites are fatal. The typical person who is bitten?? More than 90+%??? One show we would see as many times as possible is the Raptor Free Flight. 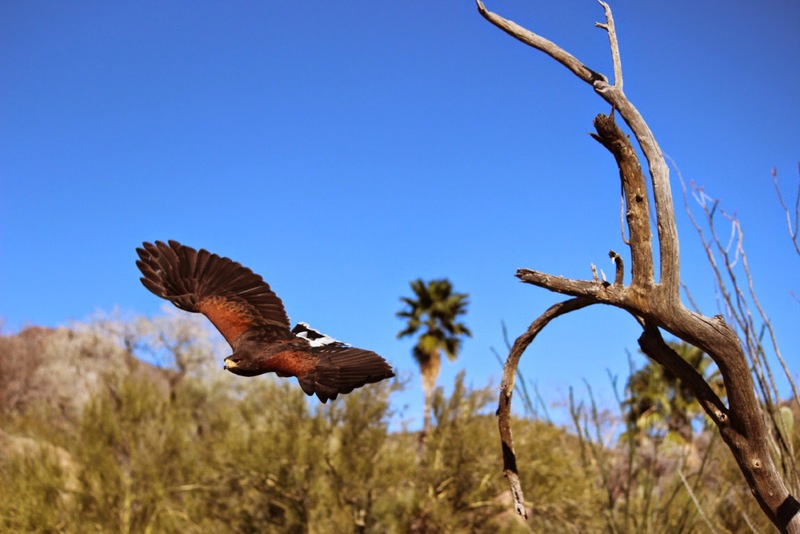 These are trained birds that demonstrate wild patterns with the help of their handlers. Arrive early for the show. The nice part is that almost every spectator spot is a good one. Lined up in three rows with railings to lean against, the birds fly overhead within inches of some spectators. 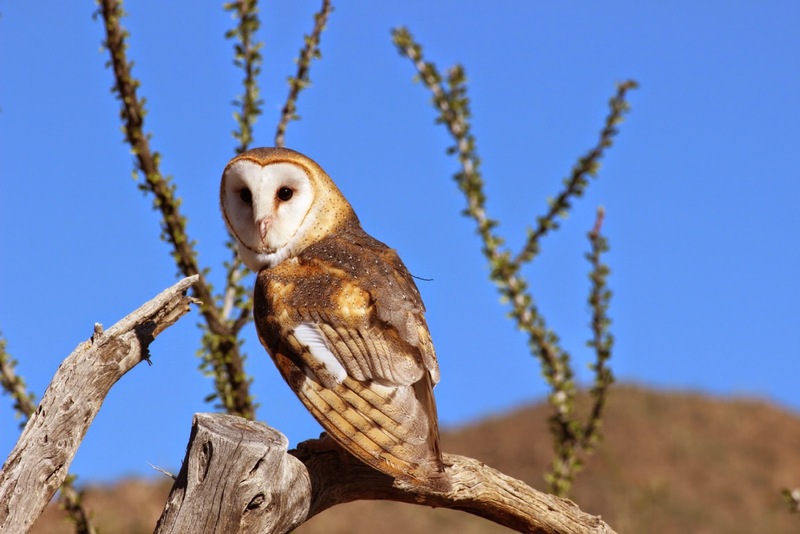 This is a barn owl. Motivation is provided by the handlers with plenty of raw food. The birds waste no time finding the snacks. 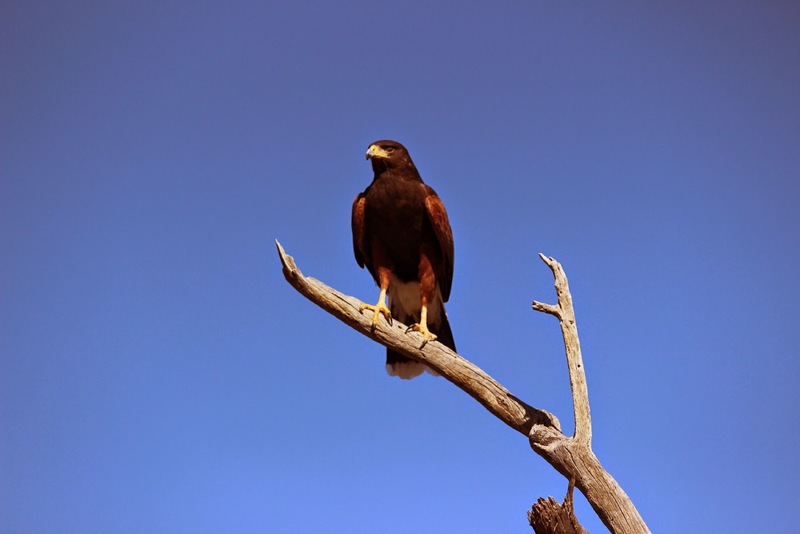 The show used four Harris Hawks. 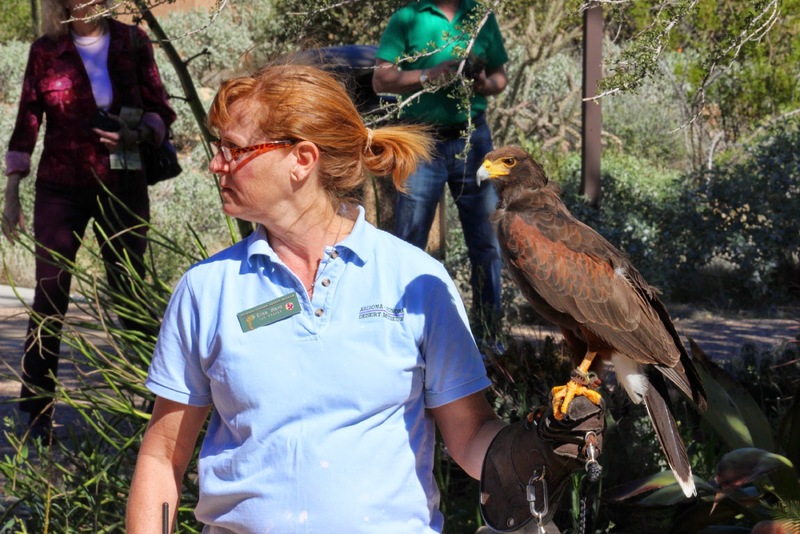 This is the same bird as earlier in this blog with the handler. The purpose of four was to show how social they are. 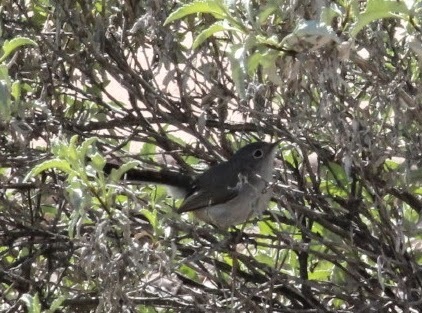 And also to show how the female is the bird in charge. 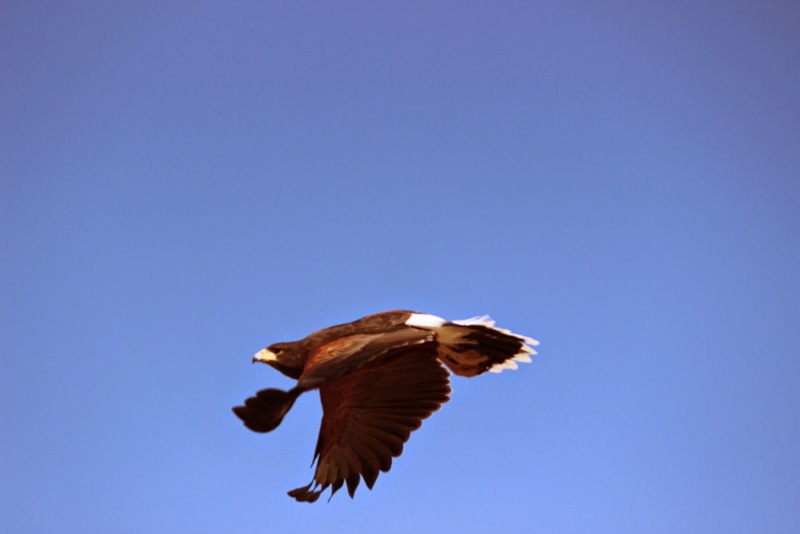 At close distances, it is amazing to watch these birds use wings, feathers, and tail to make sharp turns and cover distances instantly. A lot of "Ooh"s and "Ah"s.
Talk about watching an air show. Lots of animals to see. The settings were well placed and natural. This is the Javelina. 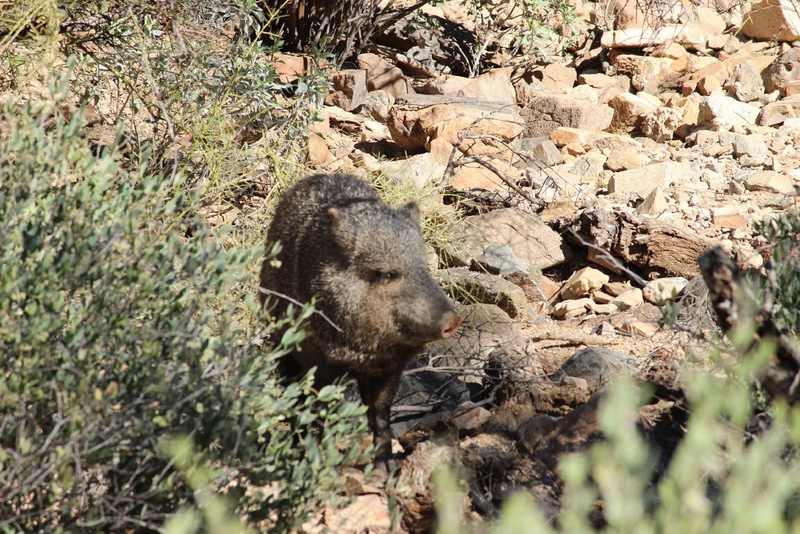 Looks like a wild pig but is of the "peccary" family. A fairly new but numerous addition to Arizona. 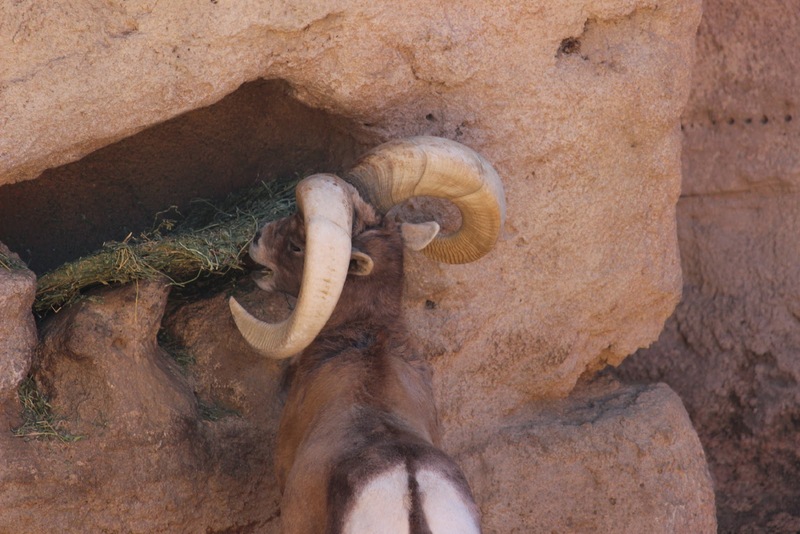 We saw Bighorn Sheep in Utah, but keep missing them in Arizona and other states. Unlike deer, the horns are there for life and are quite heavy. We actually had a chance to pick up one horn----very heavy!!!!. With all of the many animals, there are some wonderful exhibits like the otter exhibit where we saw the closeup of the otter and watched him building his home with leaves and swimming back and forth to get more. Same kind of exhibits for beaver and coyote and cougar among others. 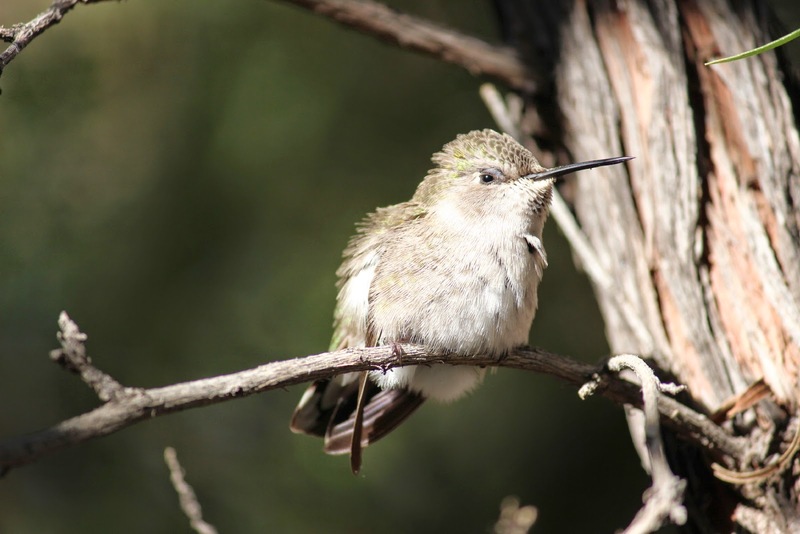 The Hummingbird Aviary holds about 13 to 16 hummingbirds of different variety. This is a tiny nest. 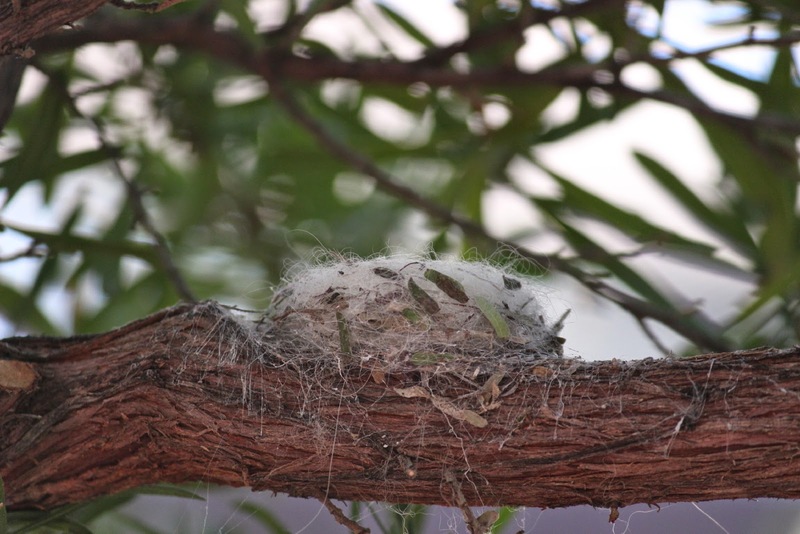 The birds use a lot of spider web to hold it together and attach to tree limbs. 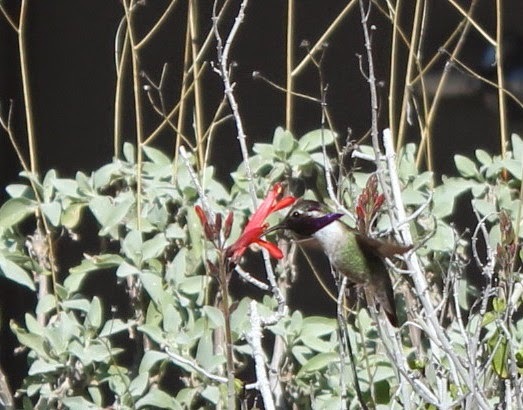 There were all colors of birds. You would walk around the exhibit and they would buzz within an inch or so of your ear. Sometimes they stop right in front of you. 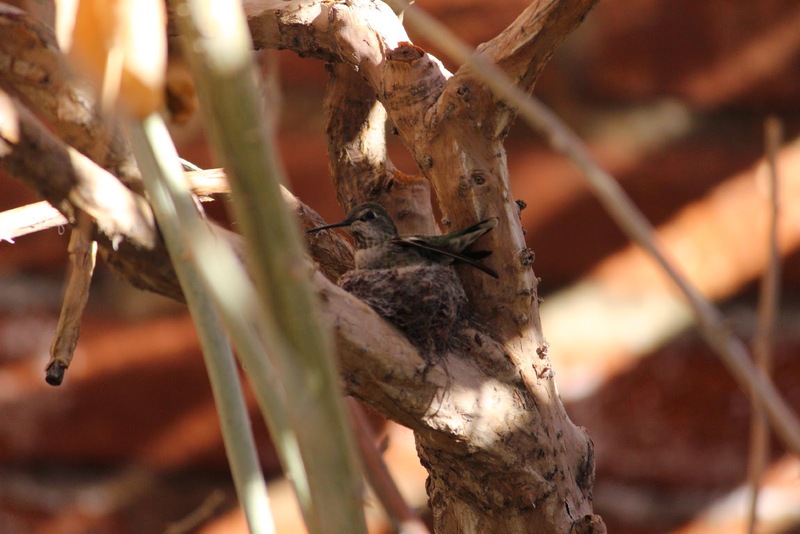 The docent indicated that the eggs are about the size of a tic-tac. 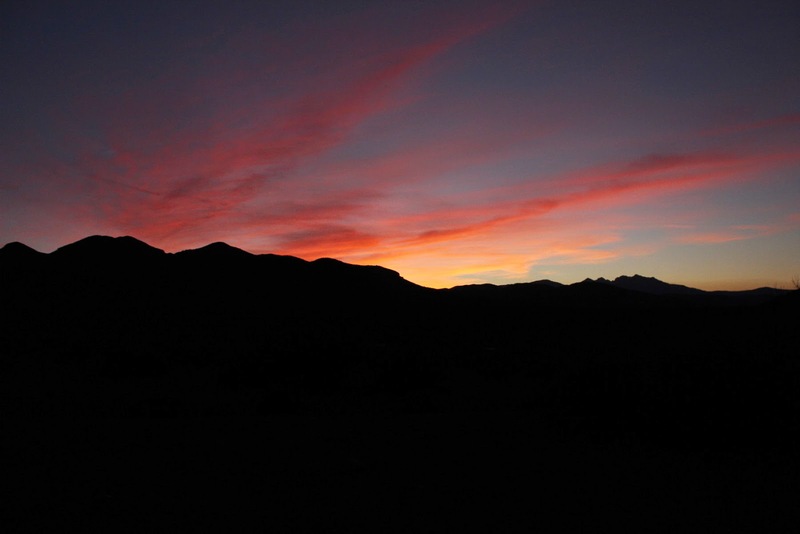 From Katherine Landing, Jan and I headed south to Quartzsite again. But this time we pulled off Route 95 north of town into Plomosa BLM land. Since we did not need water or a dump station, this was a free stay for two days. We found this section to be very quiet with only a few other boondockers. 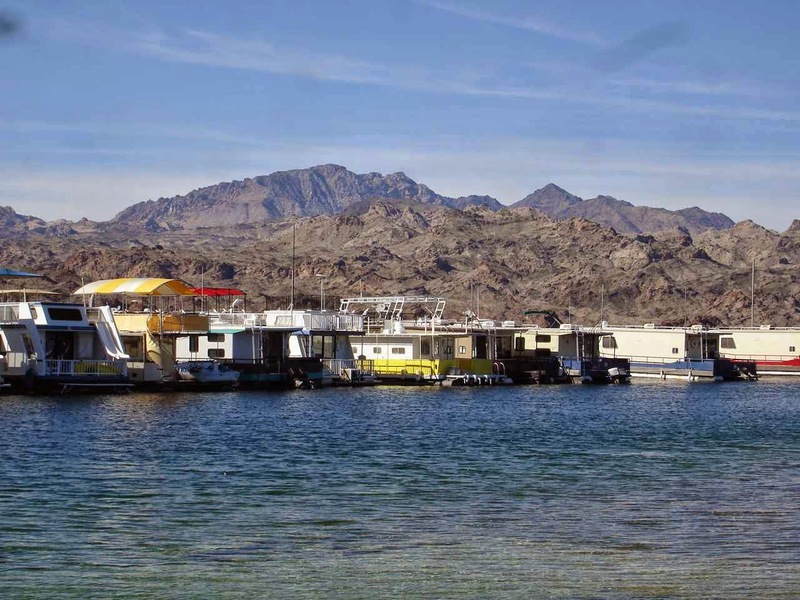 This picture to the right is of the marina at Katherine Landing. 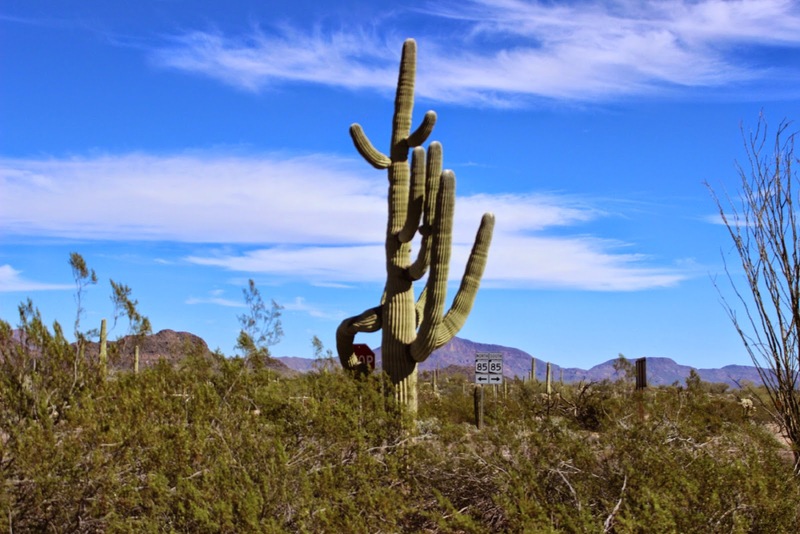 From Quartzsite, we headed east on Route 10 to Route 85 south to Gila Bend. On the way east we were treated to a flyover by what I think was a F-35 fighter jet. He turned right in front of us at what looked like a few hundred feet off the highway. In banking his turn south we were able to see a clear view of the top of the jet with the right wing pointing straight down to the highway. Impressive!! And fast!!! And loud!! 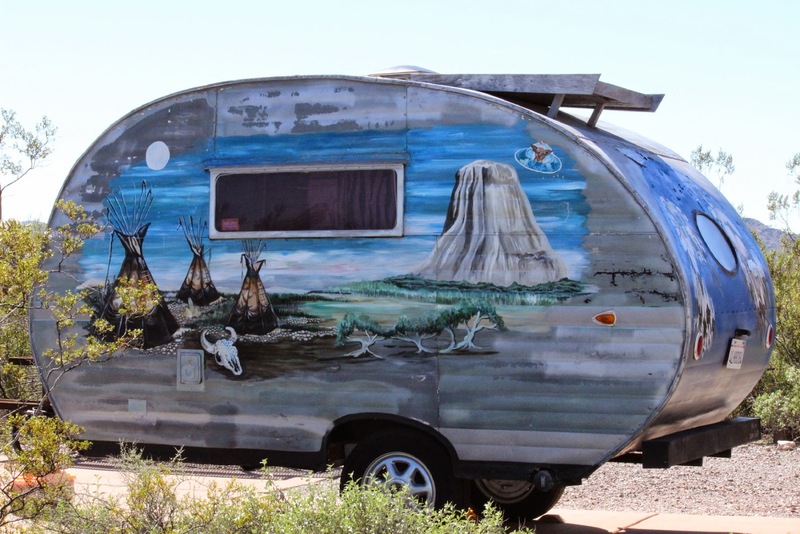 In Gila Bend we stopped at Augie's Quail Run Rv Park. 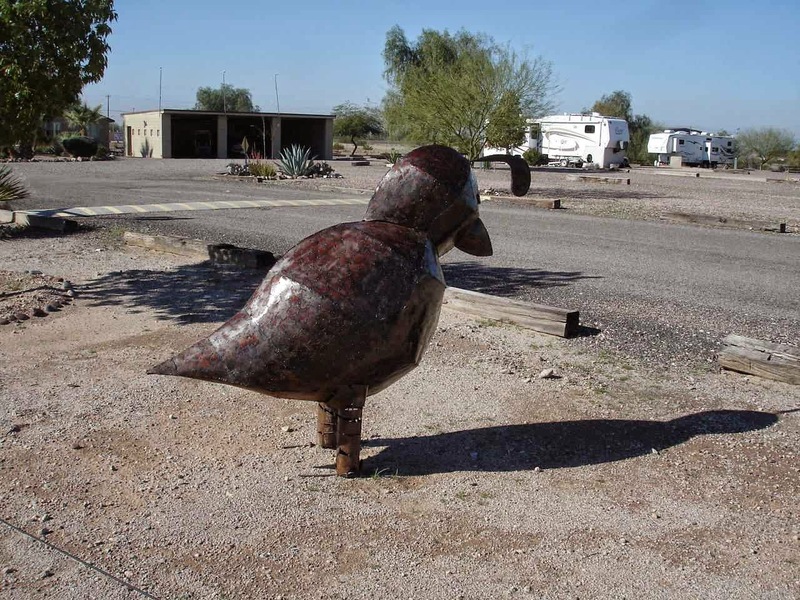 The picture above is a metal sculpture there of a Gambel's Quail. This is an unexpected highlight. It is right off Route 8. But you might expect an average campground. It is not. It is quite neat and clean with some tight rules--no old units--no excess belongings allowed outside. And a super clean laundry. Augie has owned it since 2002. The sites are also well spaced. Augie indicated that he is running with a $230 per month cost for a full hookup site. 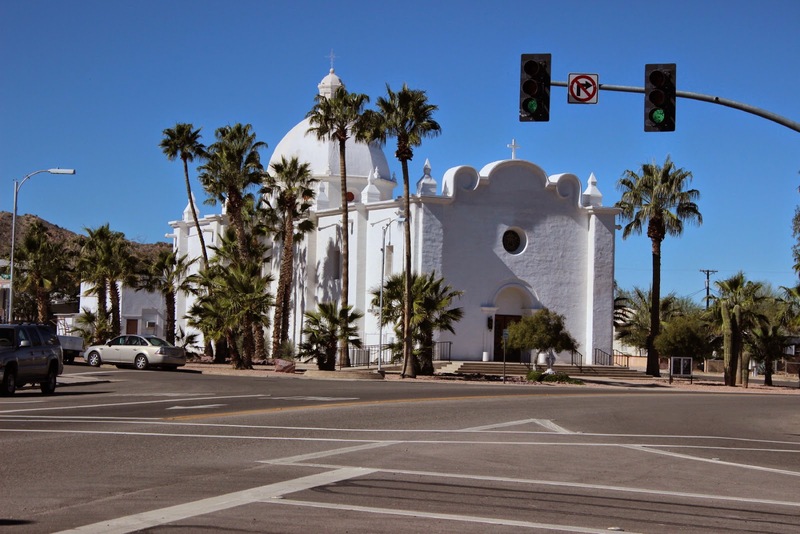 South out of Gila Bend, it is a straight shot to Organ Pipe with a stop at the pretty little town of Ajo. This was once a mining town with a railroad stop. 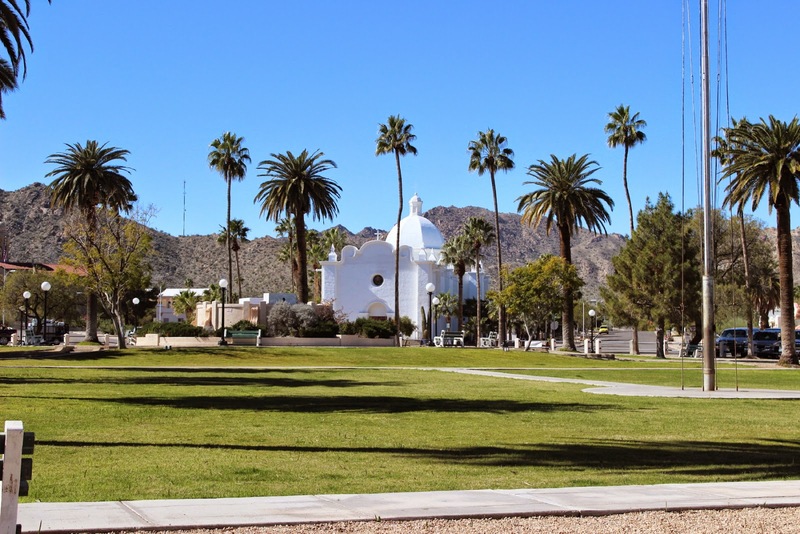 Now it is a snowbird stop and retirement community with a beautiful town square, a good golf course, and a lot of activities. This is the Immaculate Conception Church. This is a look across the square from the old train station. Jan and I had a great lunch from the Oasis Deli. It was a quiet day , so we could grab a small table outside and enjoy the square. 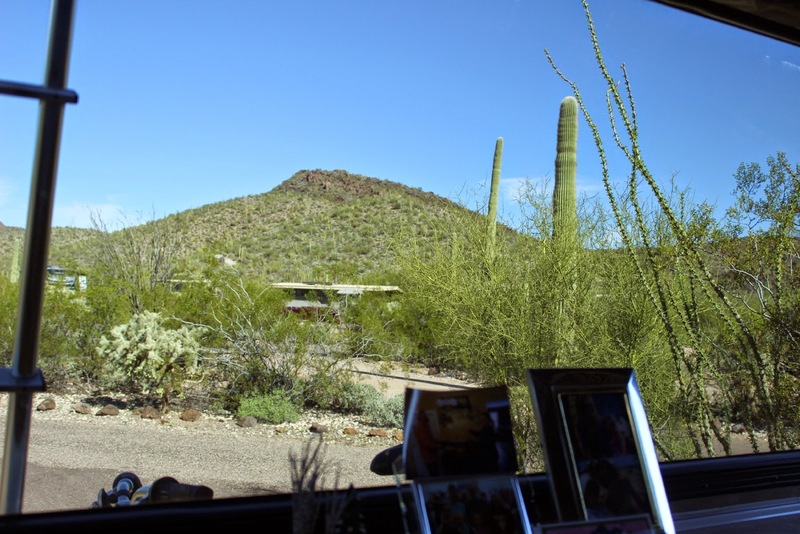 This is Jan's view from our back window at Organ Pipe. The sites are well spaced and quite long for a National Campground. Sections are divided into RVs with generator useage(no hookups in this park), A few rows with "no generator", and a few rows of tenting only. With our senior pass the cost is $6 per night. 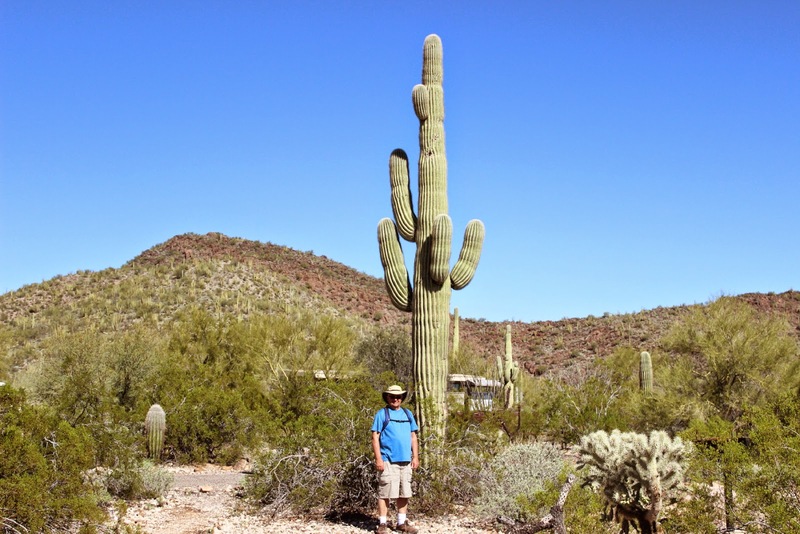 I tried to stay out of the picture, but we needed someone there to show how tall some of these Saguaros are. 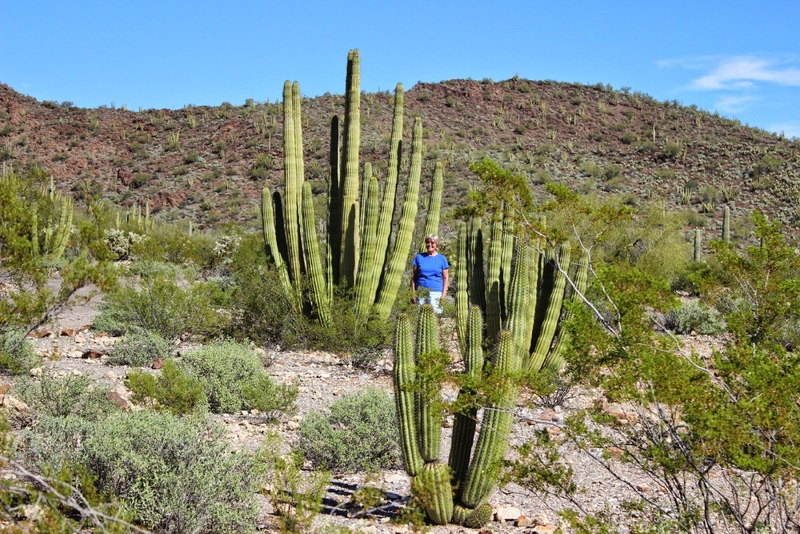 A ten year old Saguaro may only be one and a half inches tall. Looking at this one, realize that they do not produce arms until about 70 years old. A full grown one like this one can weigh between 3200 to 4800 pounds. A lot of water!!!!! As you can see from Jan, these can also grow rather tall. No!! Do not touch, Bruce. 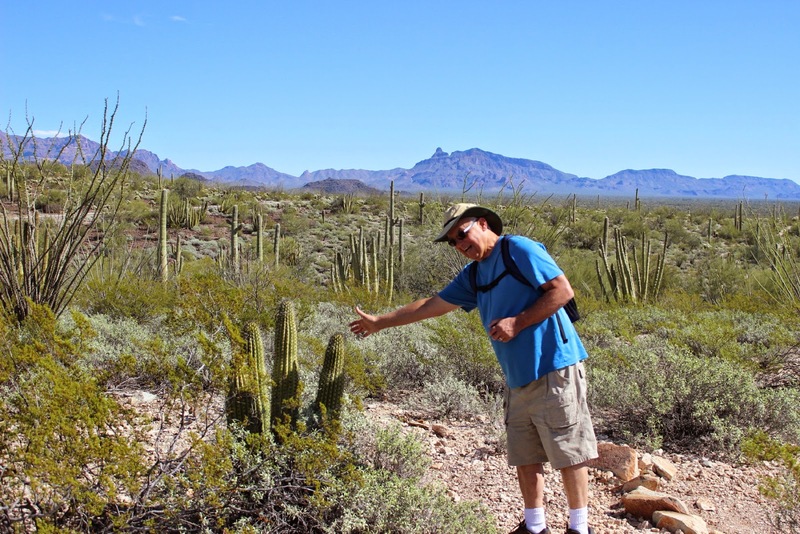 This part of the Sonoran Desert is lush with many varieties of plants. This is partly due to a good (desert)quantity of rain from the winter, slow and deep rains, to the gully washer downpours of the summer. As you can see, not too far from the Mexican border. 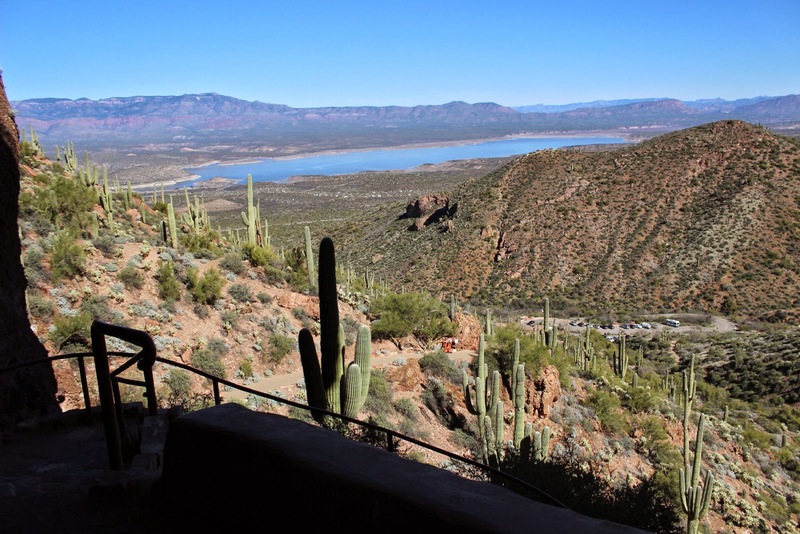 Guests freely go on long hikes into the over 300,000 acres. 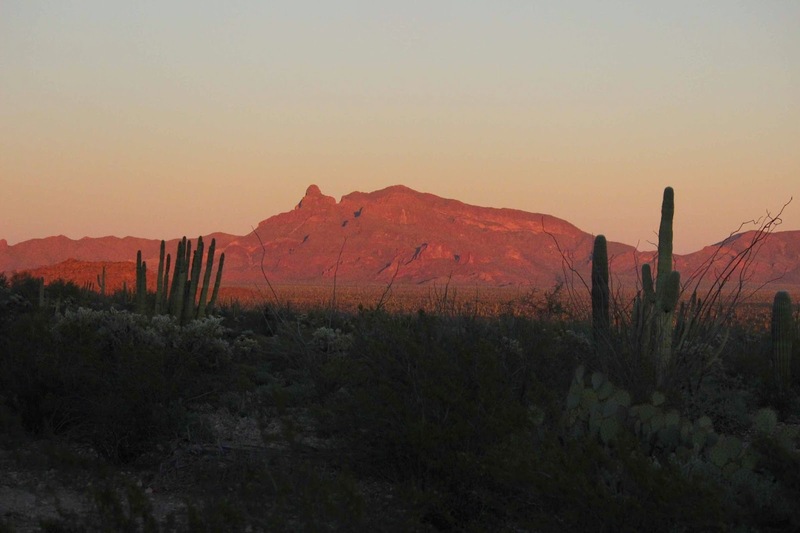 There are warnings to be safe and be aware of possible runners from the border. 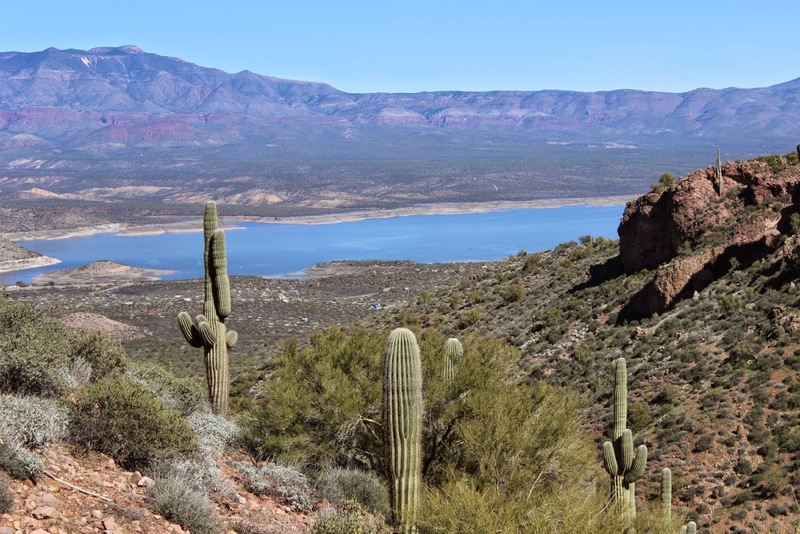 There are a number of hikes and rides into the desert and all the views are wonderful. Some cactus have a lot of character. 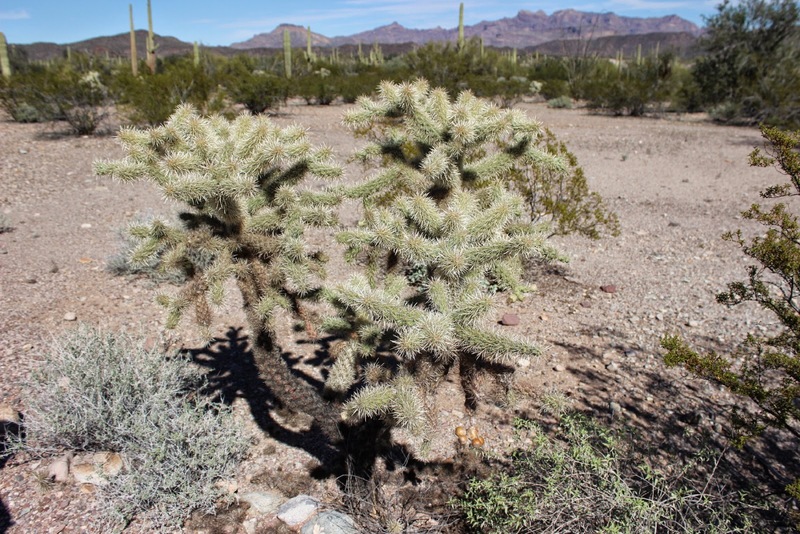 There are a lot of Teddy Bear Cholla here. They are called Teddy Bear because they look so cuddly. These are some of the sharpest thorns. 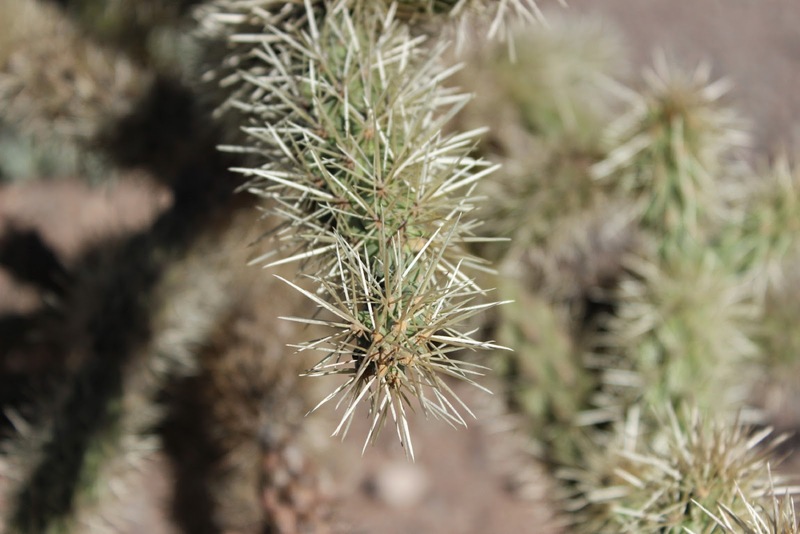 Some of the Chollas are called "jumping chollas", because they seem to jump at you with easily detached branches that are very painful. 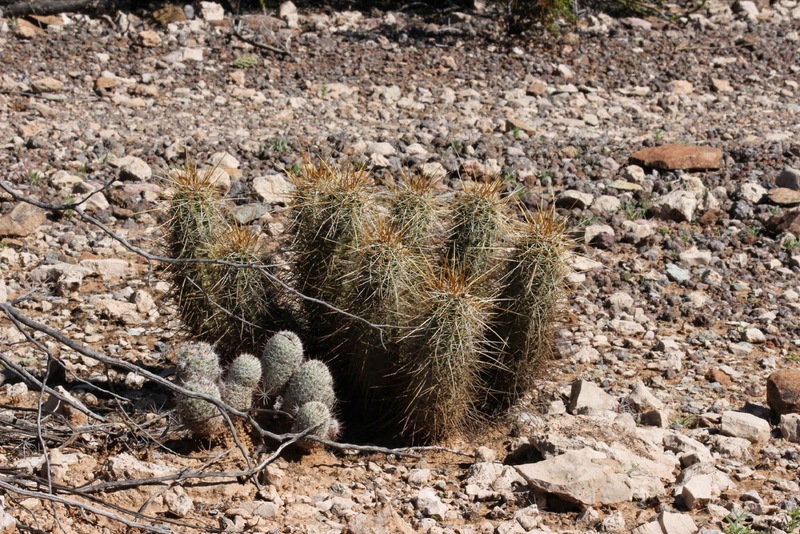 Besides the giants, there are small cactus like these hedgehog and small ones. Some have rocks placed around them so you won't accidentally step on them. 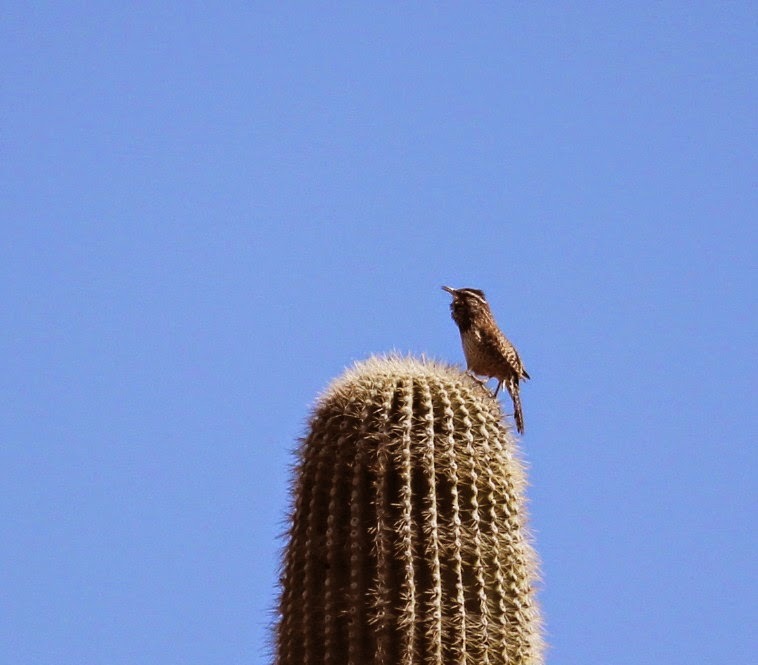 Amazingly, they are quite comfortable on and in and around the cactus. 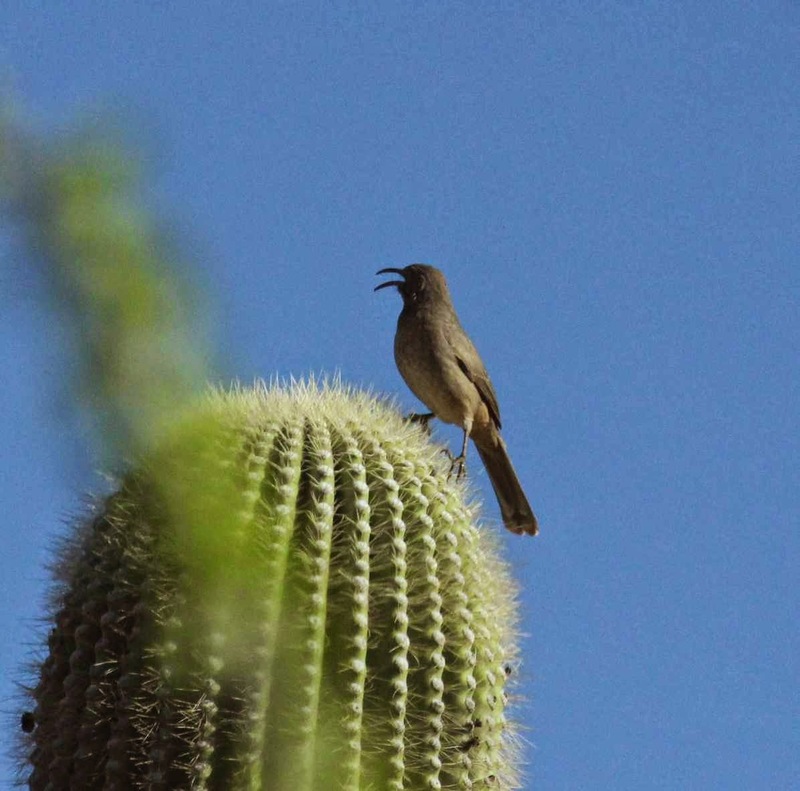 This is a Cactus Wren. Not sure who this one is. If you know, let us know. 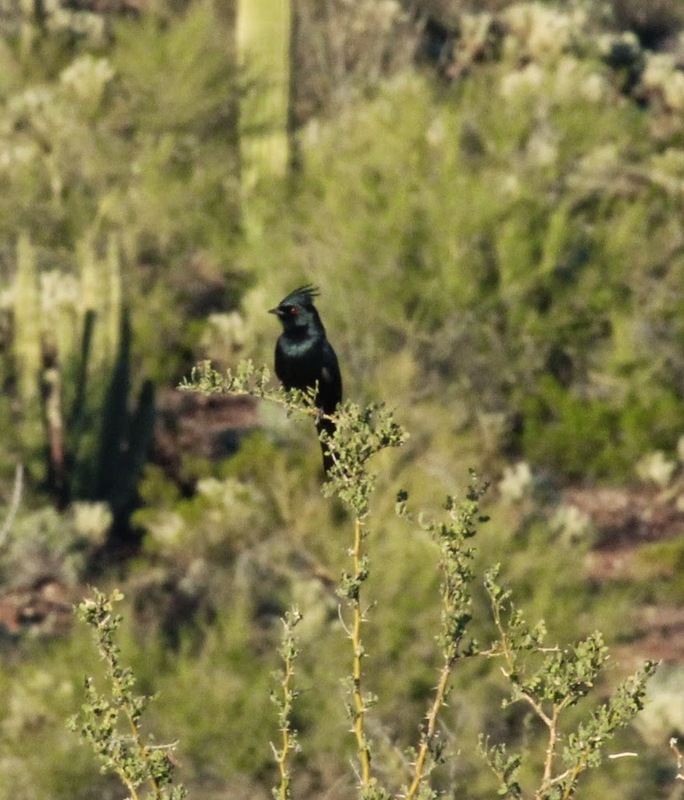 This guy that looks like a black cardinal is a Phainopepla. 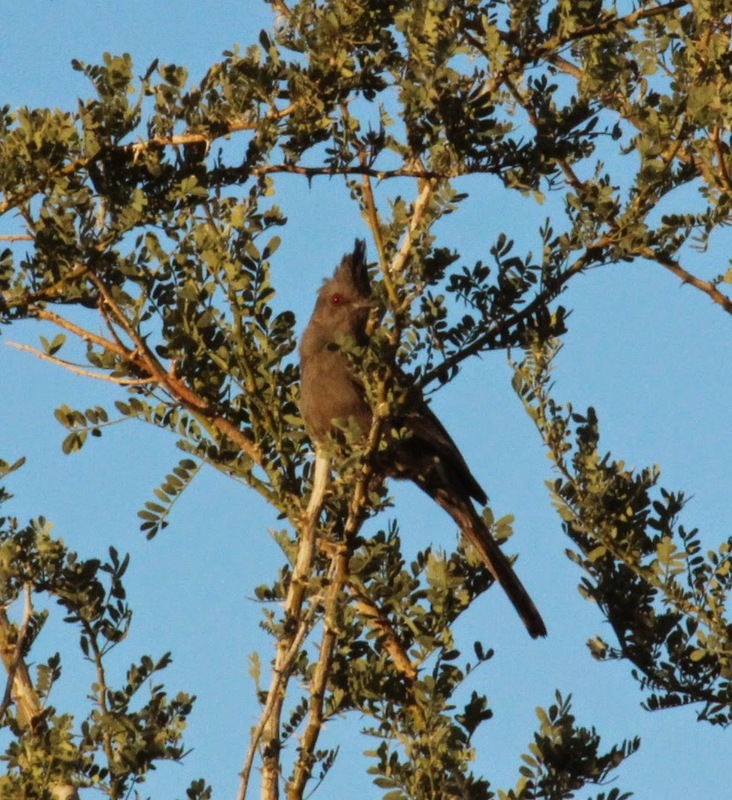 We are not sure on this one either, but they dart in and out of the Creosote bushes and Mesquite. 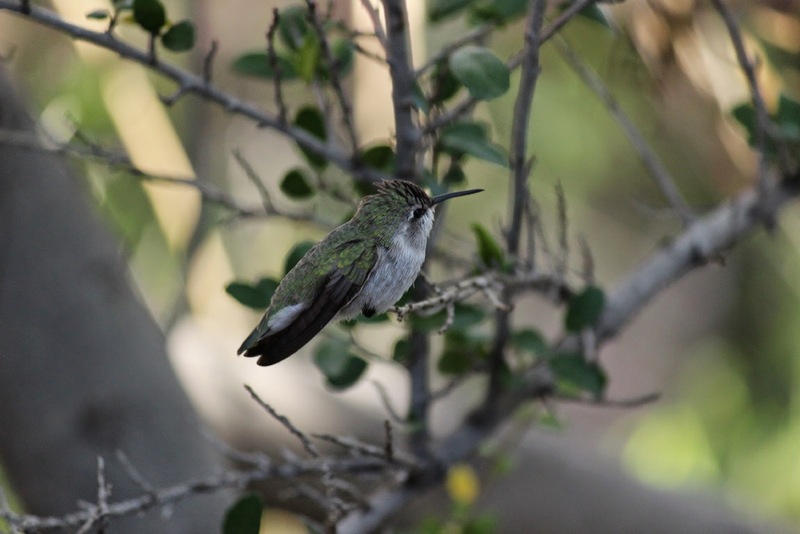 The Costa's Hummingbirds are all around the park. 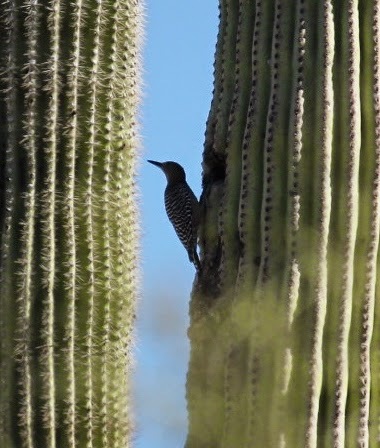 The Gila Woodpecker is an important part of the community. 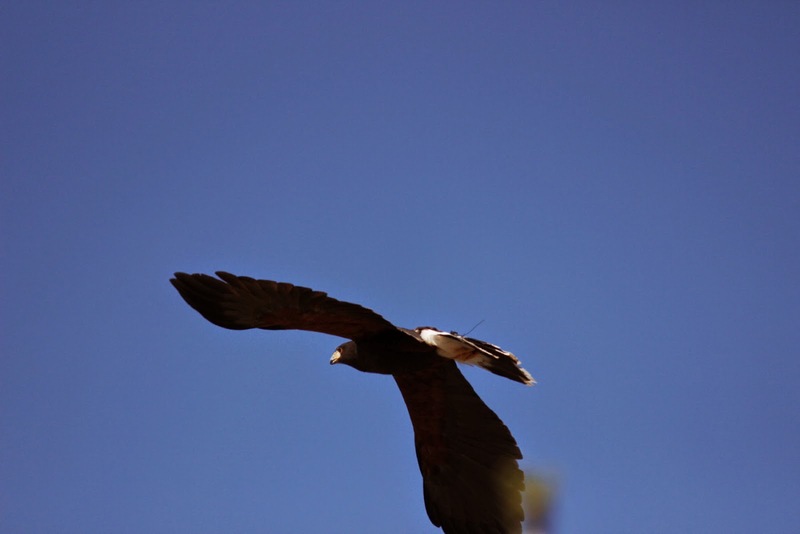 They make some large holes that are then used by a number of different birds. 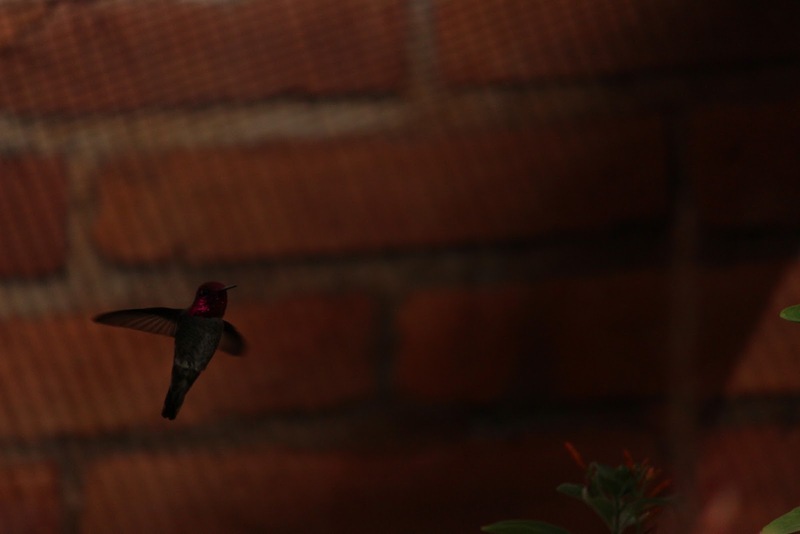 By the way, I will say that all of these birds pictures were taken by me. And I am stating that because I am so happy in situations like this to be able to use the new camera and the telephoto lens. The old Saguaro begin to fall apart and you can see the strong ribs that have held up the heavy cactus. These ribs are well used for fences and other building possibilities. This example gives you a better idea of how strong these ribs can be. There are some old trailers in here. This one is well kept and has beautiful murals on both sides. We did not see anyone here to ask about the painting. You can see a solar panel installed on the roof. Note the new wheels and tires. Also in the campground was a pristine 1958 Airstream trailer. 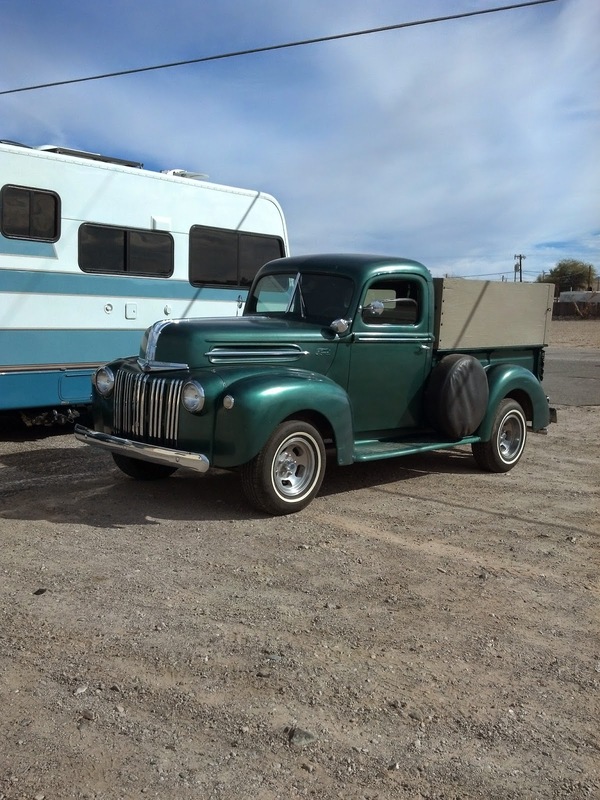 Speaking of old cars, this truck we came across at the Ehrenburg, Arizona post office. The owner indicated an early 1940's Ford. He also indicated that underneath is pretty much all Chevrolet. He said the parts fit???? I thought Cliff would appreciate this. Even with no clouds, there can be some spectacular sunsets. 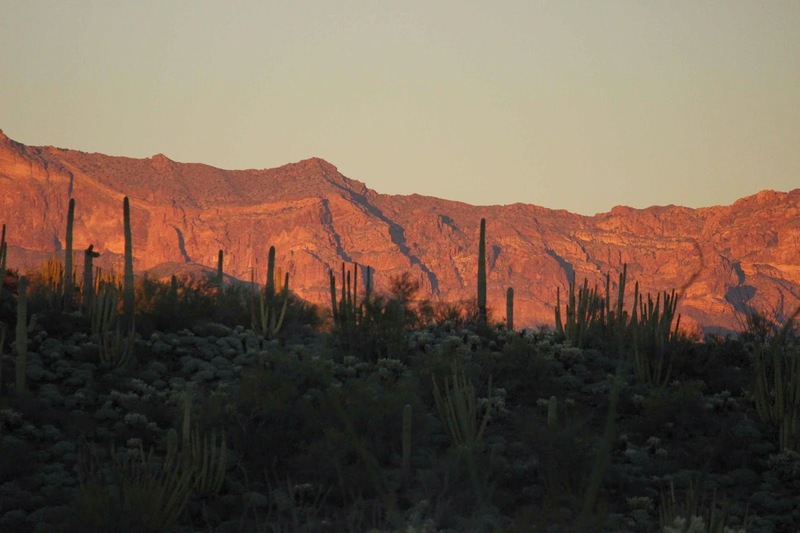 You can possibly understand why we met a number of people who keep coming back to Organ Pipe?